and fall of 2011 and my continuing adventures in ancient civilizations research. "I maintain my conviction that there are NO pyramids at Visoko, Bosnia. 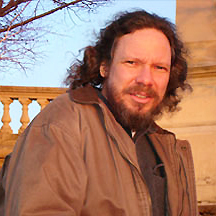 ODDLY, Associate Professor of Natural Sciences at the College of General Studies at Boston University, Robert M. Schoch, has publicly claimed (repeatedly, and still maintains) that the pyramid complex discovered in April 2005 by Dr. Semir Osmanagić (Americanized as "Osmanagich") in Visoko, Bosnia does not exist. 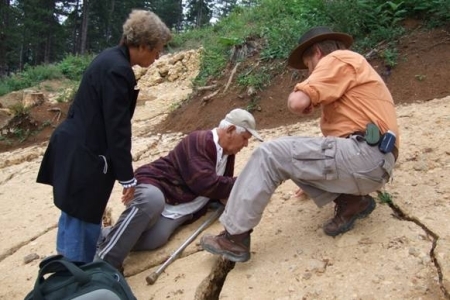 Yale-educated geologist and geophysicist Robert M. Schoch has maintained for over six years that hundreds of international volunteers working for the nonprofit organization Archaeological Park: Bosnian Pyramid of the Sun Foundation have colluded with its founder, Dr. Osmanagich, to fake excavation results and engage in scientific misconduct and scientific fraud. Schoch's libel shifted briefly to slander in August 2012, in an ad-hoc interview with U.S.O.K.S. 's Anne Fairman in Urfa, Turkey. In the interview, Schoch spoke of the Bosnian pyramids as "21st century" pyramids, that is, as pyramids being created in modern times (not excavated) by Archaeological Park workers. But let's go back to the beginning of Schoch's strange tango with anti-science in regard to the Bosnian pyramid complex. 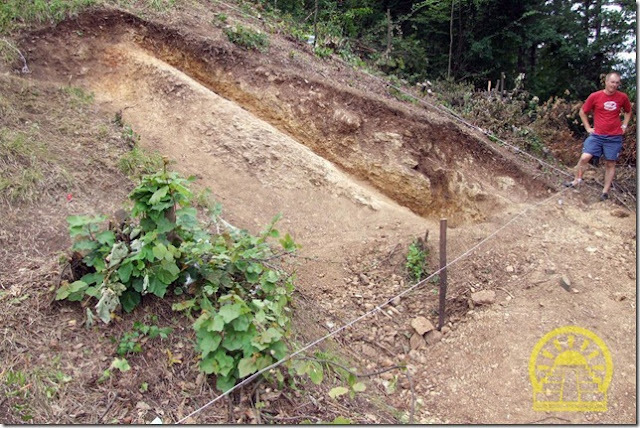 In his November 10, 2006 letter to Science magazine, Schoch maligns and libels the Archaeological Park nonprofit project, stating that "fossils are being ignored and destroyed during the 'excavations,' as crews work to shape the natural hills into crude semblances of the Mayan-style step pyramids with which Osmanagic is so enamored." 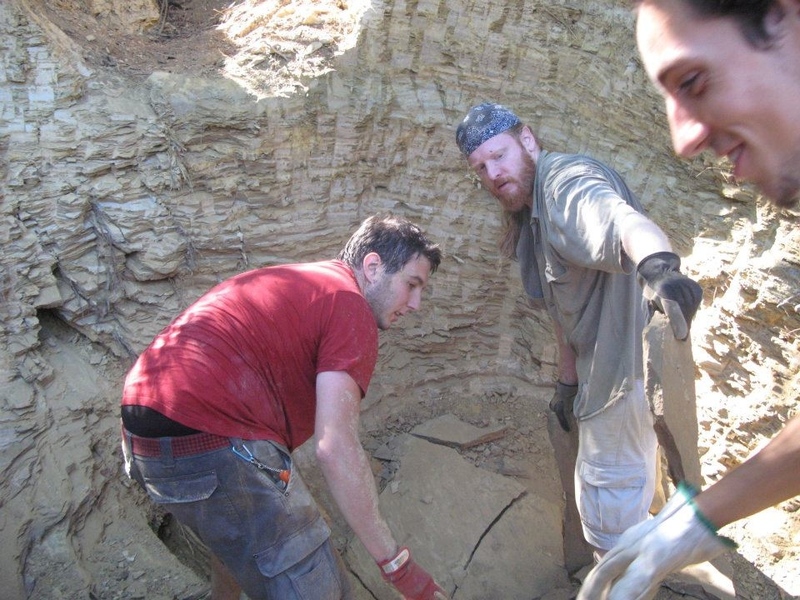 This is a photo of an excavation site that Schoch visited on the Bosnian Pyramid of the Moon. 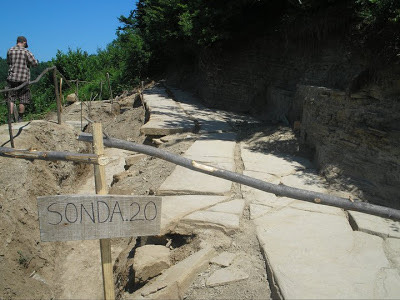 The excavation, also known as "Sonda 20," is of a large-stone terrace more than halfway up the pyramid. 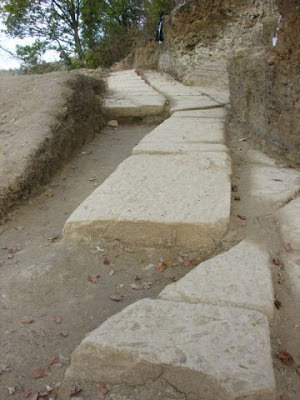 Excavated structural stone terrace on the Bosnian Pyramid of the Moon. 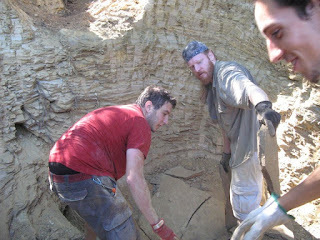 Here is another excavation site that Dr. Schoch visited. 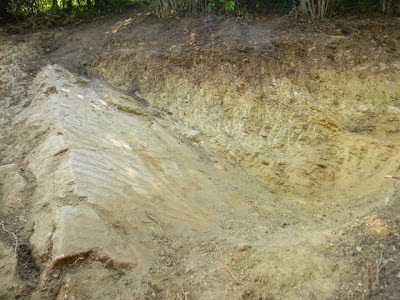 This excavation is of a stone terrace near the base of the Bosnian Pyramid of the Moon. Notice the approximately two-meter-deep clay layer on the right, topped by another, smaller-stone terrace. Schoch accuses the Foundation of trying to make this excavation look like a "step pyramid." I wonder if Schoch makes a similar accusation of the workers on the Easter Island excavations? 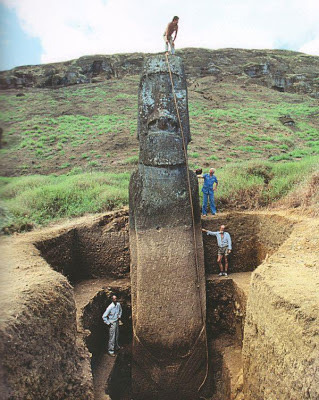 Easter Island excavation. A step pyramid in the making? Or perhaps there is a simpler answer. 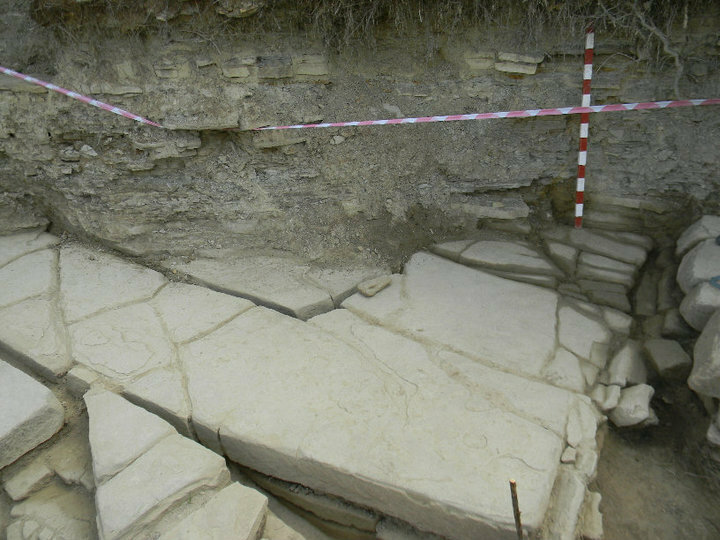 Perhaps it is standard archaeological practice to leave tall clay-layer or soil-layer steps with vertical faces. Dr. Schoch claims that Archaeological Park excavations are evidence that the Foundation's volunteers are shaping several-million-ton mountains into the likenesses of pyramids to try to fool the world into thinking that ancient pyramids exist in Bosnia. 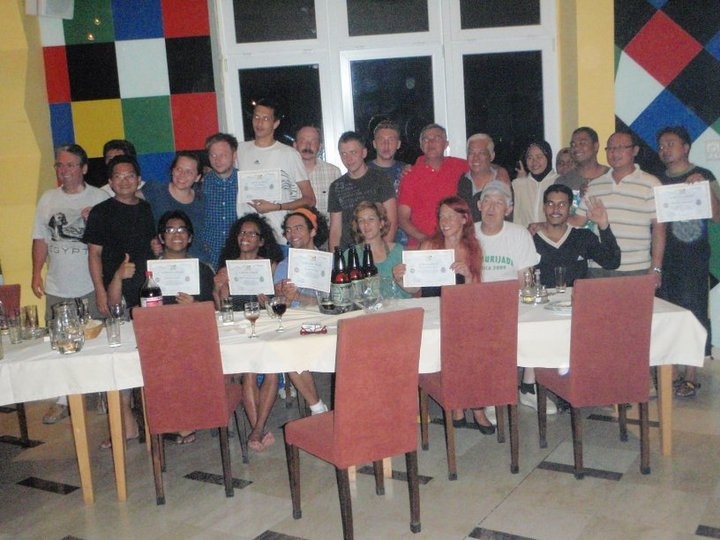 The Foundation's teams of international volunteers (more than 900 in the last three years) might be surprised to learn what Robert Schoch thinks of them. 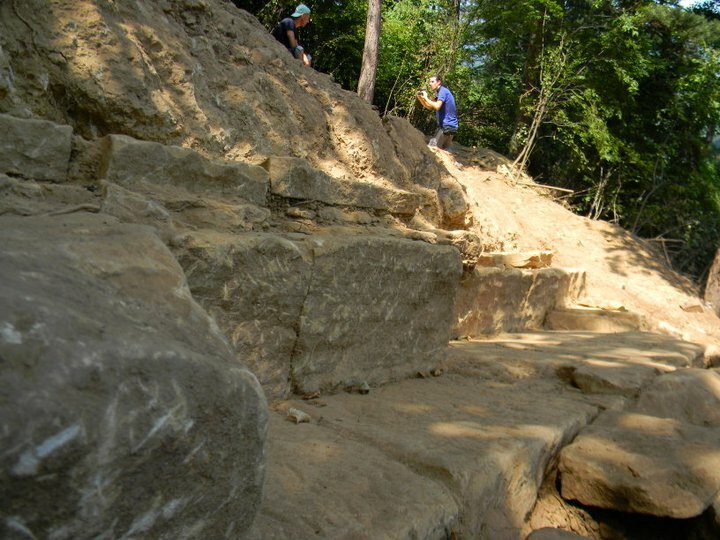 "Osmanagic's crews continue their excavations, and as a result the hills surrounding the vicinity of Visoko are being carved and sculpted into Mayan-style step pyramids [bolding mine] and their remains hauled off with a tremendous loss of artifacts and fossils. 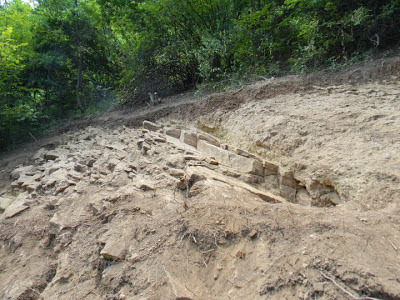 If there were no pyramids in Bosnia when Osmanagic started his project, it seems there will be by the time he is finished with it, to the detriment of the genuine ancient heritage of the region." Instead of taking Dr. Schoch and his co-author to court, Dr. Semir Osmanagich simply offered a point-by-point response to Schoch's bizarre accusations in a May 22, 2011 article titled, "How Many Times Has Dr. Schoch Been Wrong?" Dr. Osmanagich concludes: ". . . when one comes to Visoko and sees these great pyramids, one understands the absurdity of Schoch's allegations." Dr. Osmanagich, a scientist whose primary passion is uncovering humankind's true history, has little time for court battles. His days are filled with the Foundation's many projects, as he and his scientific colleagues from all over the world endeavor to "triangulate the mystery" of the largest, and the most ancient, documented pyramids in the world. Dr. Osmanagich has stated in radio and television interviews many times that, since 2007, he is not trying to prove that Bosnian pyramids exist but to find out what they're for. 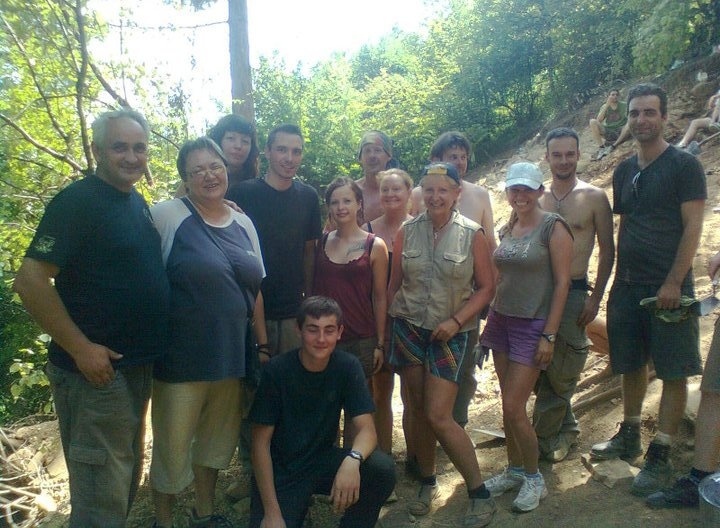 A year before Robert Schoch and Colette Dowell came to take a look at the geology of central Bosnia, Dr. Amer Smailbegovic (PhD geophysics), began some serious work: an in-depth geological study of the Visoko valley's two primary pyramid-like structures: Visočica hill and Pljesevica hill. Dr. Smailbegovic used data from six different satellite imaging systems, combined with year-2000 SRTM (Space Shuttle Endeavor) topographic data, as well as aerial photography from the Geodesic Institute of Bosnia and Herzegovina, as well as 1:50,000 scale topographic maps (courtesy of Geoimage). Dr. Smailbegovic combined all this data to create a digital topographic model that could be viewed from different angles. The most sophisticated technology known to humankind concluded what Semir Osmanagich's compass and his extensive experience with pyramids around the world had already told him: that ancient pyramids had in fact been built in Central Bosnia. Dr. Smailbegovic published his findings in February 2006, six months before Robert Schoch and his companion came to Bosnia. Although the findings of Dr. Smailbegovic's report are clear and unequivocal, its author humbly calls its findings "preliminary." Scientists are known for their humility in the face of an awesome universe. 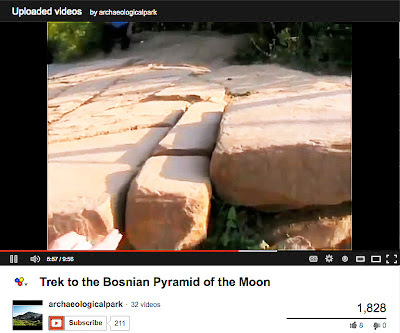 Notice the lack of the same humility in Dr. Schoch's report, which, on the basis of two photographs – one from the air and one from the ground – and without mentioning any previous geological reports' data, categorically dismisses the possibility of ancient artificial pyramid-shaped structures in the Visoko valley. 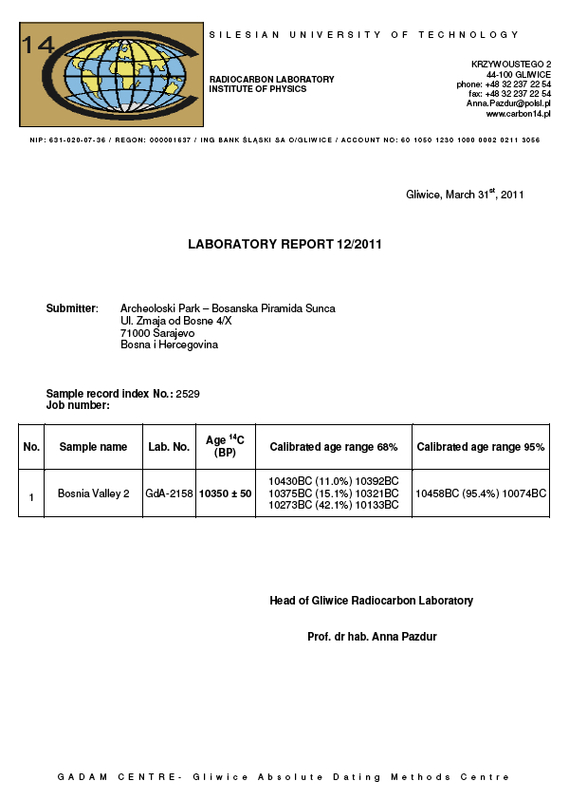 Dr. Smailbegovic's February 2006 geological report provides conclusive evidence that at least two artificially constructed pyramid-shaped structures exist at the two locations known for centuries as Visočica hill and Pljesevica hill. These structures were subsequently named by Dr. Osmanagich the Pyramid of the Sun and the Pyramid of the Moon, respectively. It is extremely unlikely that Schoch read Dr. Smailbegovic's report. If he did read it and understand it, he would never have been foolish enough to claim that ancient pyramids don't exist in Bosnia. Although it is very unlikely that Schoch, a Yale-educated geologist, read the report, I, an English major, did. Here are the findings from that report that are relevant to our discussion. Please keep in mind that 1) we wouldn't be having this discussion if Schoch had followed the mandates of the scientific method and that 2) Schoch's geological report unequivocally blames "tectonic stresses" for pyramid-shaped hills in the Visoko valley. Isn't it nice to read real science? You know you're dealing with a real scientist by his or her style of writing. Real scientists are wedded to the facts, and the more detail the better. Real scientists are always anti-generality, anti-rhetoric, and (it goes without saying) anti-schmooze. You don't have to be an expert in geology or geophysics to read good scientific English. You just need to know what the words mean to know what the scientist means. After all, that's how someone who wasn't a scientist became a scientist: by using his or her pre-PhD mind to grapple with a specific subject area. 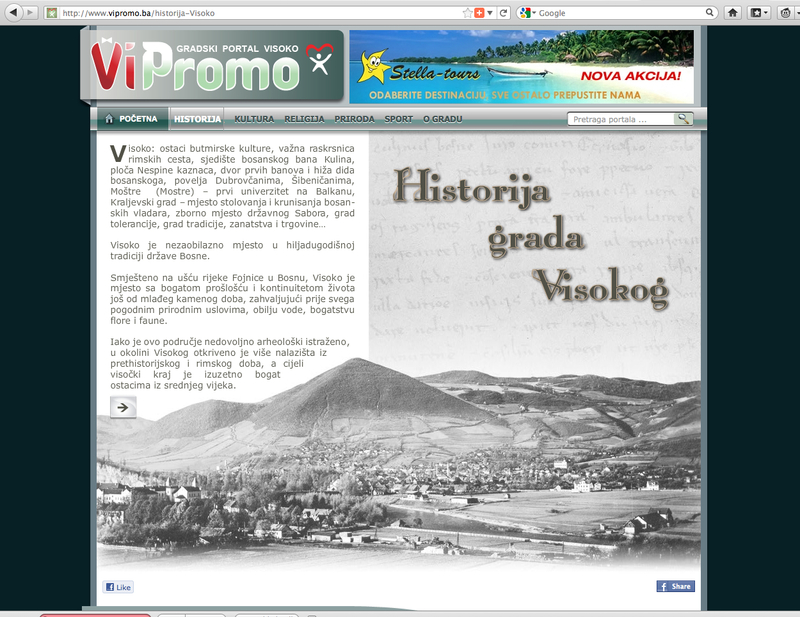 Reading the above analysis, we (awakening humanity) discover a great deal about the structures in the Visoko valley. We learn, specifically, that natural tectonic uplift does not create multi-sided triangle structures. We learn, specifically, that tectonic uplift, because it occurs along a fault-line, creates at most one triangular face (if any). We learn that "tectonic stresses" could not have been the creators of the pyramid-shaped structures in the Visoko valley, or the creators of pyramid-shaped structures anywhere else, for that matter. Isn't science amazing? Science is clear, so very clear. Notice how many times Robert Schoch uses the word "seems" in his writing. This is the mark of a man who has not done his research. The short, faux-science rambling that Robert Schoch provides his plebeian audience, in lieu of a thorough geological report, makes several things clear: 1) Robert Schoch thinks his readers are stupid and hopes that they remain so; 2) Robert Schoch was either too lazy to read Dr. Smailbegovic's report or too unethical to engage its science; and 3) Robert Schoch is, without any doubt whatsoever, anti-science. Amazingly, Robert Schoch's anti-scientific views on the Bosnian pyramids do carry some weight in cyberspace and elsewhere. Some of the public have been caught in Schoch's sticky, schmoozy, anti-science web. Edwin van Mossel, director and DP of the documentary film, "The Bosnian Pyramids: The Biggest Hoax In History?" has fully bought Schoch's anti-science nonsense. He responded to my January 2013 query by parroting the orthodoxy's "tectonics" argument: "It seemed so promising, but after a short week we noticed that there was a lot of breccia created by tectonics, and no 'pyramids' at all. 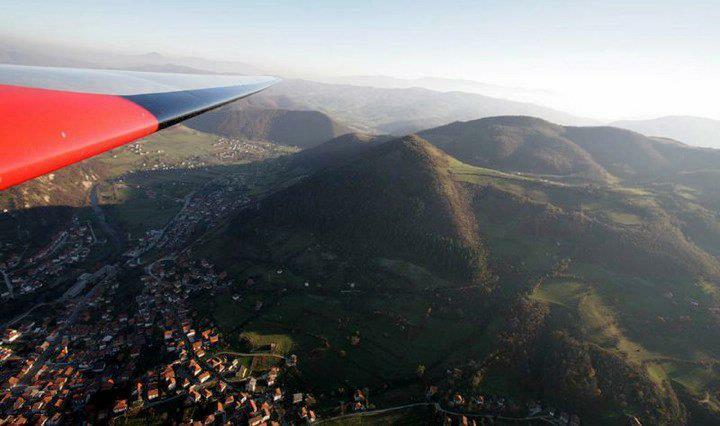 Bosnia is loaded with natural pyramid-shaped hills! Every researcher who went there and came back with the conclusion 'no pyramids' is ignored. It would be great if I am wrong, but alas, I do not think I am . 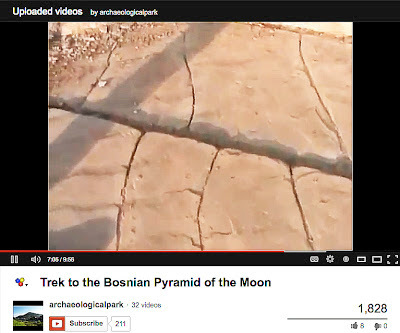 . ." Most documentary filmmakers who travel to Bosnia these days end up pointing their cameras at pyramids. Schoch's supporters in the archaeological community, though by no means legion, are certainly prominent: Anthony Harding, Zahi Hawass, Claudia Valentino (Editor-in-Chief of Archaeology Magazine) and others in the archaeological orthodoxy, an orthodoxy which is spearheaded by the brick-headed Archaeological Institute of America (which publishes Archaeology magazine) and the European Association of Archaeologists, whose stated aim, "to promote proper ethical and scientific standards for archaeological work" is at best a joke but more probably a lie to subvert the true history of humankind and keep the "rise of agriculture" professors in students and salaries. Speaking of free rides, Schoch writes: "I had a chance to see the Visoko region from the air, and this only further convinced me that the features are natural hills and not artificial pyramids." 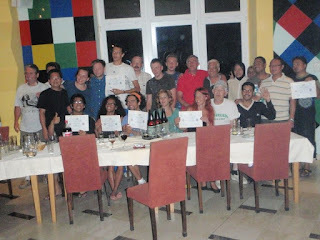 Notice the photo's extreme lack of clarity, its haziness, its dimness, its distance. This is a geologist's only published photo of his aerial study? If I were given a plane ride over the Visoko valley, I'd take a lot more (and better) photos than this, and I don't even have a PhD in geology and geophysics from Yale. It almost seems that the photographer is trying to obscure the subject he is purporting to study. 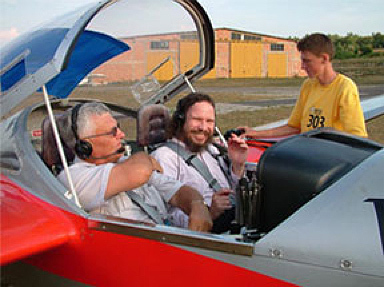 1) Why does professional geologist Robert Schoch offer the readers of his official website only one hazy photo of his airplane excursion? 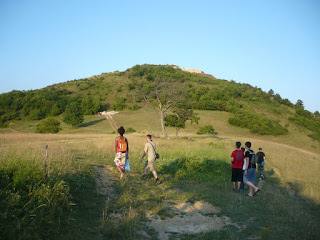 2) Why is this photo taken approximately a mile away from Visočica hill or the Bosnian Pyramid of the Sun? 3) Why is this photo taken from the side and not more from above, which would better show the topography of the pyramid, or what Schoch believes to be a "natural hill"? 4) Does Dr. Schoch believe that a single distant aerial photo could help any geologist ascertain something about geological structures below? 5) Where are Dr. Schoch's photos of the other features that Dr. Osmanagich refers to? For instance, where are Schoch's photos of the Bosnian Pyramid of the Moon, the Bosnian Pyramid of the Dragon, the Bosnian Pyramid of Love, the Temple of Mother Earth, the Vratnica Tumulus? 6) If one were really interested in performing science as a geologist and geophysicist, wouldn't one want to capture each of these features with great clarity, and from many angles, so that one could study them at length later on and make a professional judgment based in part on this multitude of very clear photos? 7) Why is topographical analysis not an obvious concern of Dr. Schoch's? Is topography irrelevant to geology in the good doctor's mind? 8) Is this one small photo really the best that a Yale-educated geologist can do with two free hands and a camera, or was he just goofing around? Dr. Schoch having a good time before his free plane ride over the Visoko valley. Earth to Schoch . . . Earth to Schoch . 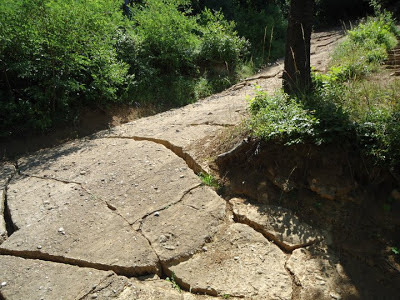 . .
"The geology around Visoko is incredibly rich, and I suggested to Osmanagic that, in lieu of 'pyramids,' he might redefine his 'Archaeological Park' as a 'Geological-Archaeological Park' and focus more on the geology. Visocica Hill (the one dubbed 'Pyramid of the Sun') and Pljesevica Hill ('Pyramid of the Moon') are composed of layers of sandstone, clay, mudstone, siltstone, and conglomerates apparently deposited in an ancient lake and river system during Miocene times (about 5.3 to 23 million years ago)." Thank you for this Geology 101 course, Dr. Schoch. We're sure you're going to get to the point soon. 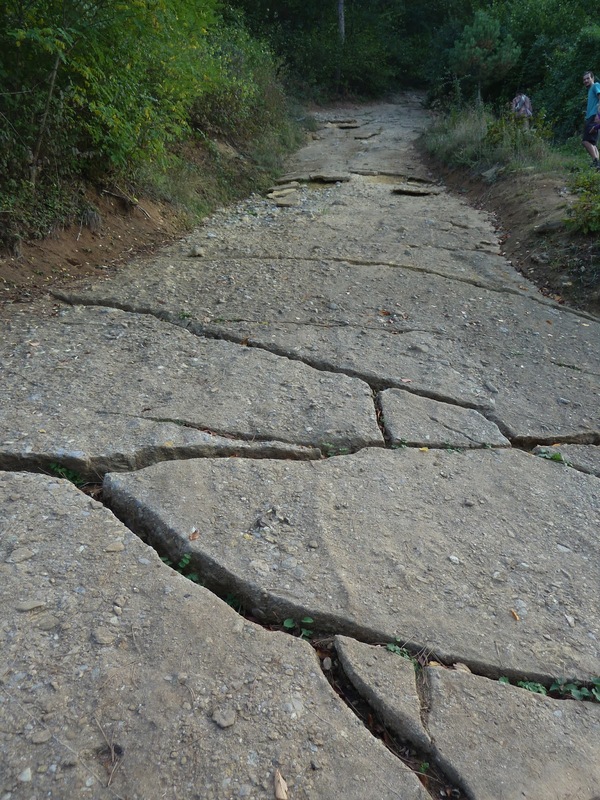 "The rocks have been tilted and bent due to tectonic stresses (this can be seen in the last photo to the right, which shows a natural folding and faulting in the rocks composing the side of a so-called pyramid in Visoko)." 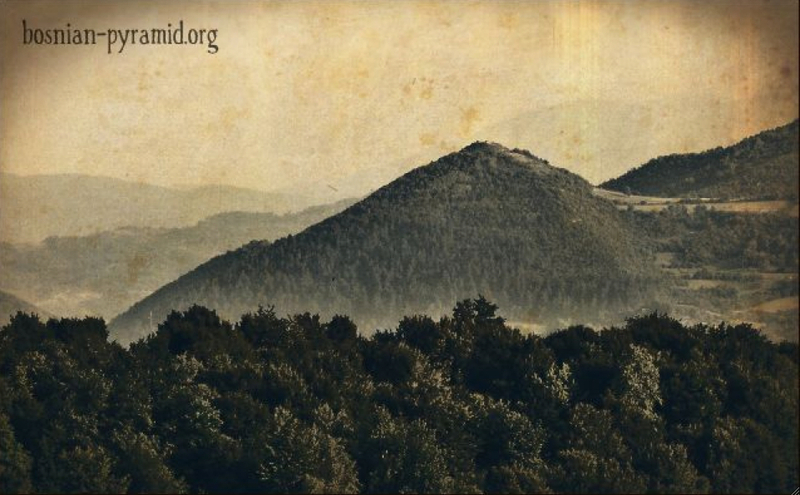 Whatever our thoughts on Schoch's interpretation of the photo, his readers don't have any idea if this is a photo of the Bosnian Pyramid of the Moon or of the Bosnian Pyramid of the Sun or some other feature in or near Visoko. Neither the photo label nor the photo's text describes or names it. But hey, Schoch's readers will no doubt figure it out. If they dig. What would "digging" entail? Writing to Dr. Schoch to ask what this photo depicts. But if Dr. Schoch had wanted us to know this information, surely he would have provided it in the first place. We could always write Dr. Semir Osmanagich to ask what the photo depicts. I'm sure Dr. Osmanagich has nothing better to do than to identify a photo that Dr. Schoch took over six years ago. "The tectonic forces plastically deformed the clays and mudstones, but the sandstones and conglomerates broke into semi-regularly shaped pieces that Osmanagic and his team have excavated in numerous places, interpreting them as 'pavements,' 'terraces,' 'concrete blocks,' 'foundation stones,' and so forth. . . ."
Notice that Dr. Schoch does not provide us with photos of these pavements, terraces, concrete blocks, foundation stones, "and so forth" that he so readily and unequivocally dismisses as natural. 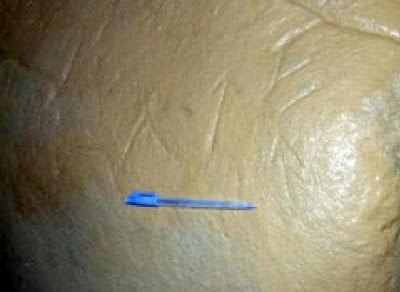 If Schoch had provided such photos, as a real scientist would have, the following photos, or something like them, are what we might have seen in his report. Exposed northeast corner of the Bosnian Pyramid of the Sun – slope angle, 43.822 degrees. 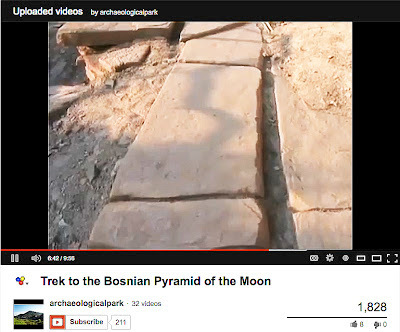 Above are photos of artificial concrete blocks that cover the Bosnian Pyramid of the Sun. How do we know these blocks are artificial? How do we know they are not the result of natural tectonic forces upheaving and breaking apart natural sedimentary layers? 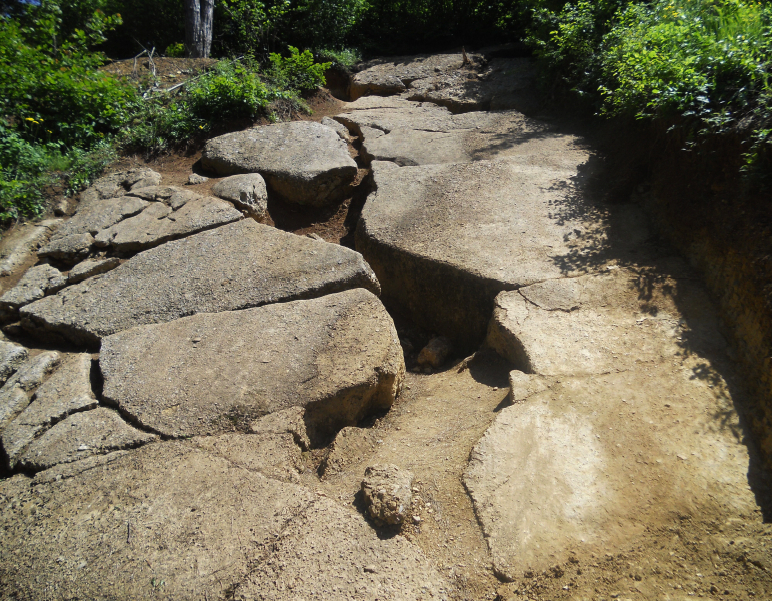 As independent researcher Nenad Djurdjević notes, these knobby-topped concrete blocks could not have broken apart tectonically, as Dr. Schoch would have us believe, because the broken blocks would have exhibited irregular (non-smooth) sides. The points of weakness would have been small internal stones, and one side of a broken block would have gotten an internal stone, and one side would have gotten a hole where the internal stone had been. Instead, we see only smooth sides on the concrete blocks. Thus, we know that these blocks must be artificial. Schoch's "tectonic stresses" theory cannot explain the formation of the blocks in these photos. Perhaps that's why he never provided us with pictures, if in fact he ever took any. 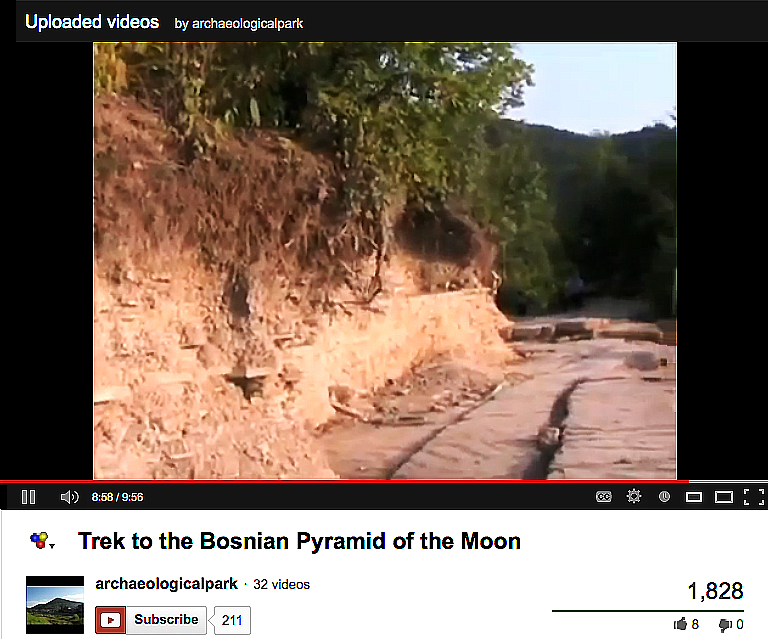 Now, let's take a trek to the Bosnian Pyramid of the Moon. Excavation sites on the Bosnian Pyramid of the Moon. 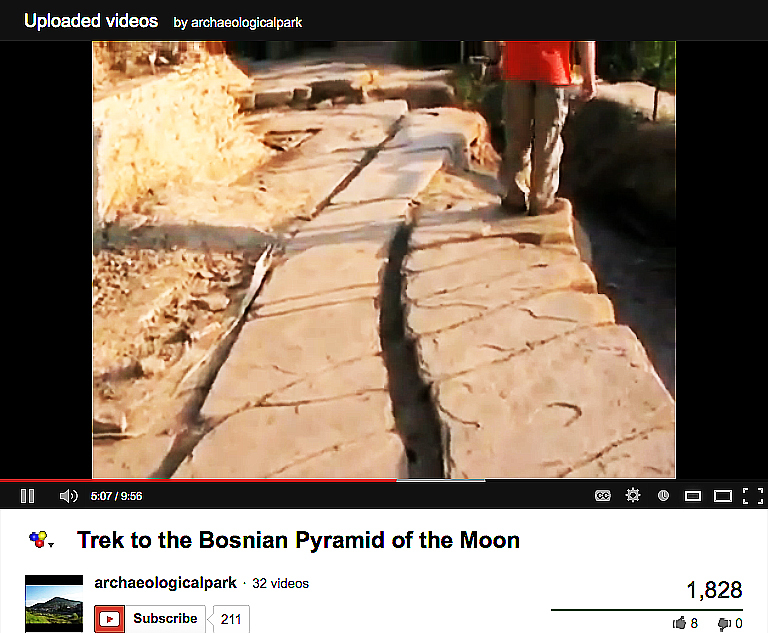 Doubly inclined terrace, Bosnian Pyramid of the Moon. The above photo depicts a doubly inclined terrace near the base of the Bosnian Pyramid of the Moon. What does "doubly inclined terrace" mean? 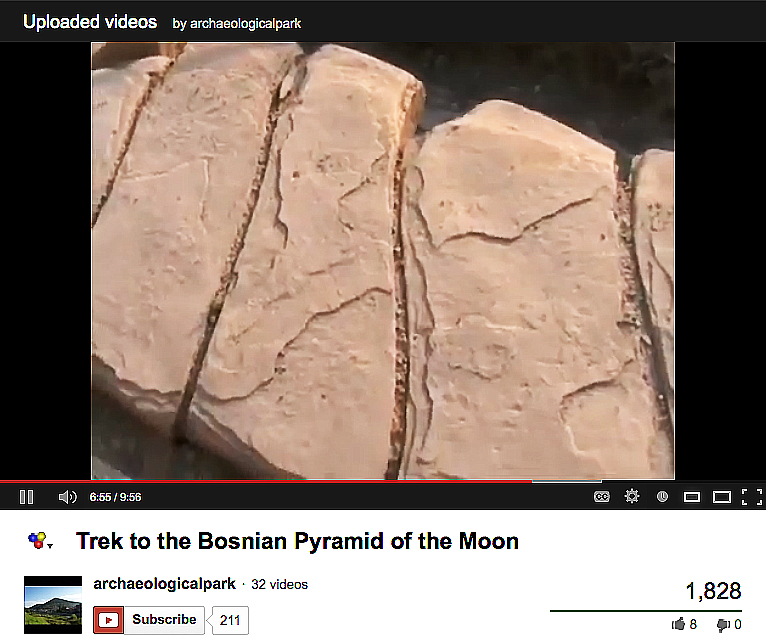 This artificial stone terrace on the Bosnian Pyramid of the Moon is inclined in two ways. As it spirals around the pyramid (inclining up or down, depending on which way you're looking), it also inclines toward the center of the pyramid. Why does it incline toward the center? To keep the terrace from slipping down the side of the pyramid. This double inclination makes a structurally strong addition to the pyramid. Let's get back to our photo montage, a montage markedly absent from Robert Schoch's "analysis" of the Bosnian pyramid complex. 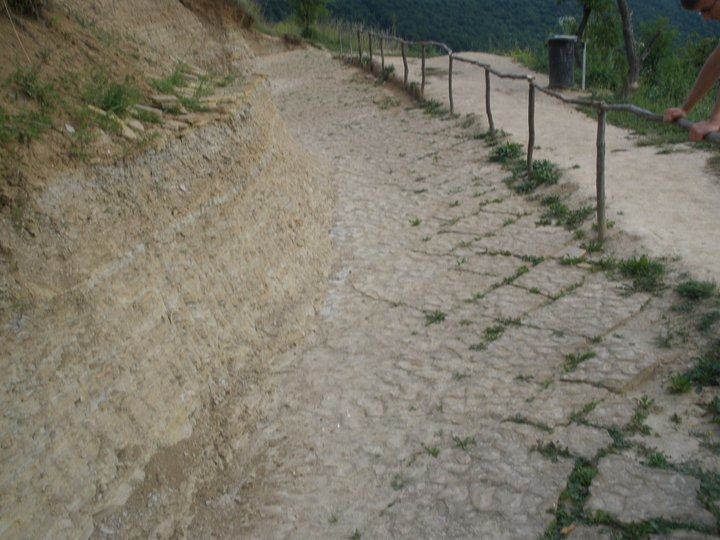 Doubly inclined terrace on the Bosnian Pyramid of the Moon. For a detailed explanation of the soil, clay, stone-terrace relationship on the ancient Bosnian Pyramid of the Moon, feel free to watch a short video I shot on August 14, 2011 with a scientist named Nenad Djurdjević. The video is titled "Trek to the Bosnian Pyramid of the Moon." Notice the attention to detail that independent researcher Mr. Djurdjević consistently exhibits. ". . . Interestingly, and tellingly, the sizes of the sandstone and conglomerate blocks found are a function of the thickness of the original rock layers. Thin sandstone layers, stressed tectonically, broke into small blocks while thick and durable conglomerate layers broke into massive blocks. This is exactly the pattern expected among natural rock formations." This makes sense! Thin rocks break into small pieces, thick rocks break into bigger pieces. Excellent sleuthing, Dr. Schoch! We must applaud the good doctor, whose Yale education obviously hasn't let him down. Let's walk up the pyramid for 20 minutes, or so. After a difficult climb from the first terrace composed of smaller stones, we come to another excavated terrace, this one composed of much larger stones. 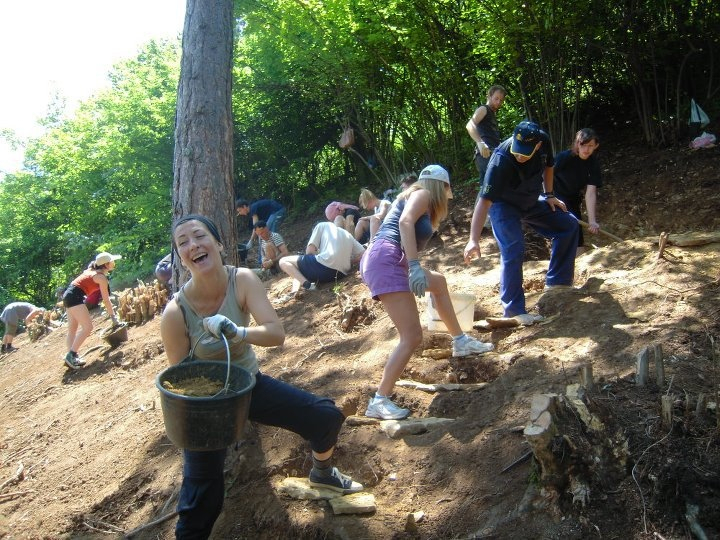 Archaeological Park volunteers excavating terrace "Sonda 20"
on the Bosnian Pyramid of the Moon. Excavated terrace "Sonda 20" on the Bosnian Pyramid of the Moon. The inclination of the terrace toward the center of the pyramid is clear. Are these the "blocks" that Schoch tells us "broke into small blocks" or "broke into massive blocks"? We'll probably never know, because it's doubtful even he knows which blocks he was talking about after all this time. Further, "small" and "massive" are relative terms, are they not? And were there any measurements of the stones or the terraces provided by our good doctor, our "scientist" from Yale? No, there are not. This is some of the stonework that Dr. Robert Schoch, harking from Yale University, claims to believe does not exist or, at best, was built on site by teams of modern-day international volunteers, none of whom were required to have any expertise whatsoever in stonework or pyramid building. The photo above shows clearly the dark brown natural soil layer (on the top left) that has accumulated over many thousands of years to the depth of an average depth of 40 centimeters, according to the Bosnian Institute for Pedology (soil study). The amount of time that it takes for one centimeter of soil to accumulate, according to the Institute, is between 250 and 300 years. This amount of soil accumulation indicates an age for the Bosnian Pyramid of the Moon of 10,000 to12,000 years. How do we know that the clay layers on the Bosnian pyramids are artificial and not the result of natural geological processes? It is pure clay: there are no random stones, no bones, no organic material in it. The clay was therefore not brought to the pyramids by flooding from below or washed down by rainwater from above. The clay layers are sometimes thin, between smaller-stone supporting terraces, sometimes thicker. 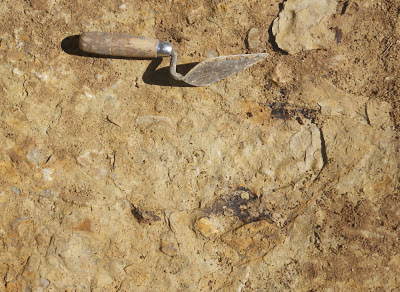 Smaller supportive flat-laid stones can be seen in the clay layer. "Sonda 20" stone terrace on the Bosnian Pyramid of the Moon. 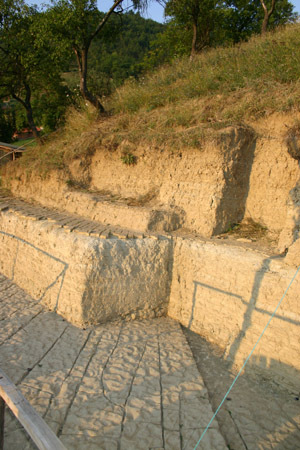 The "Sonda 20" stone terrace, like its smaller-stone cousin shown previously, was structural; it was meant to support thousands of tons of clay sitting on it forever. It was not meant to be seen by anyone. We see (part of) it now clearly, only because Semir Osmanagich had the personal courage and the scientific fortitude to fight off early (and continuing) attacks from people like Robert Schoch, Anthony Harding, and other self-styled "scientists" who have used their positions of power to try to steer public, political, and scientific opinion away from legitimate scientific inquiry. Here, in this ever-so-precise placement of stones by the ancients, is the artistic beauty that Schoch and his anti-science colleagues tried, diligently, to deny to humankind forever – stonework hidden from view for at least 12,086 years. Feast your eyes. The photos and screen-shots above show us a stonework terrace that, though beautiful in its craft and patterning, was not created with beauty in mind. This terrace is an ingenious example of structural stone terracing. Why did the ancients use stones of different sizes and different shapes, fitted together so skillfully here? Answer: to create a structure that would mitigate earthquake damage, just as the Egyptians did, just as the Maya did. Further, many of the stones' edges are curved in an "S" pattern. Fitting "S"-shaped stones together gave this ancient terrace additional flexibility, and therefore strength, during earthquake-caused lateral movement. Notice that the terrace has a foundation terrace directly below it, and that the foundation terrace itself has further terraces below it, built of smaller stones and interspersed with clay layers, to provide additional support. As you can see in many of the photos above, and in my 2011 video, the Bosnian Pyramid of the Moon's stone terrace continues to extend beneath the artificial clay layer. 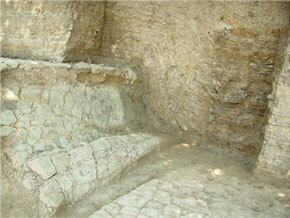 It is part of a wider terrace that continues beneath unexcavated clay. Thus, the stone terrace could not have been "placed" there by volunteers, or by Bosnian pyramids discoverer Semir Osmanagich, in the middle of the night, as Robert Schoch might have us believe. How far beneath the massive clay layer does this stone terrace extend? No one knows. 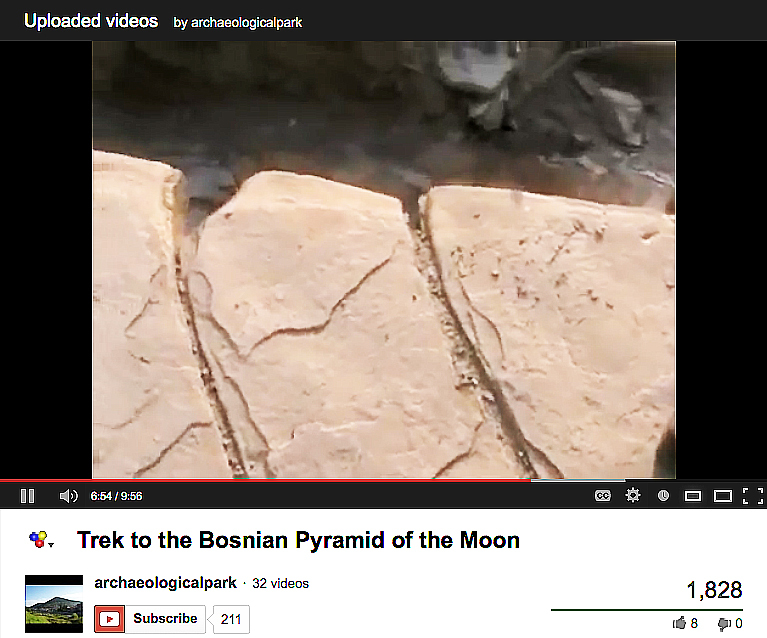 Please note that the stone terraces on the Bosnian Pyramid of the Moon use stones of three generally different sizes. Dr. Osmanagich states that there is a continuing series of three-terrace sets going up the pyramid. Each terrace-set is made up of three terraces: one terrace made of generally larger stones, one terrace made of generally smaller stones, and one terrace made of generally even smaller stones. The next set mirrors the first, and onward up the pyramid. ". . . The sandstones also typically preserve various sedimentary and depositional features, such as ripple marks and the traces of ancient burrowing animals. These same rocks are also rich in paleontology. 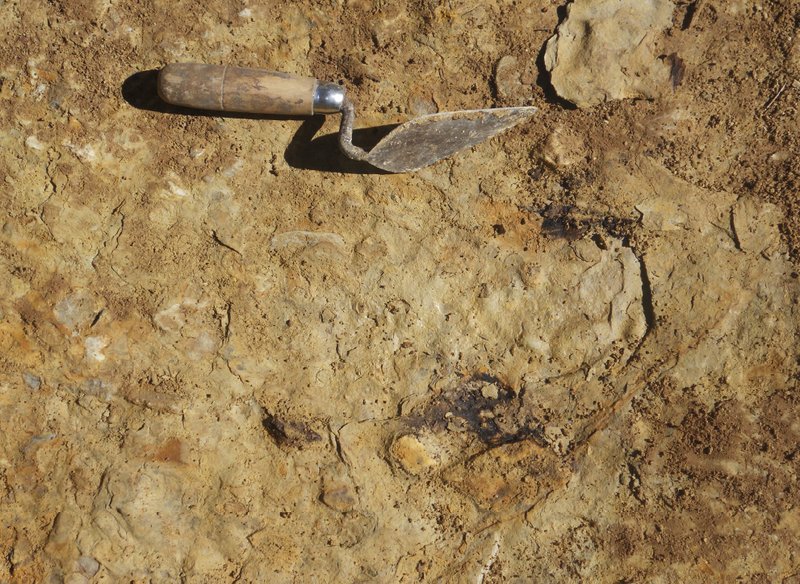 In some of the sandstone layers, and in many of the mudstone layers, I found large accumulations of fossil leaf debris and even some fairly complete Miocene fossil leaves. I believe that the real treasure of Visoko may be a huge fossil biota just waiting to be uncovered, not some imaginary pyramids." 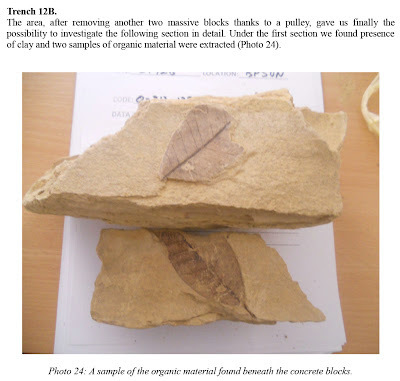 Schoch claims that he "found large accumulations of fossil leaf debris" in mudstone layers. Really? Where? In Visoko? He doesn't tell us. Where are the photos? He doesn't offer them. What is the relevance? 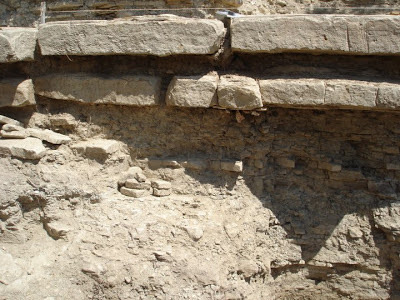 One must conclude that the relevance for Schoch is that, because fossil leaf debris has been found in mudstone layers somewhere in the world, either in Visoko or elsewhere, mudstone layers in Visoko must not be excavated by those who are not specifically seeking fossil leaf debris or other fossil biota. It is difficult to reply to an argument that is not really an argument, but let's try. Schoch is arguing, one must believe, that if you don't know what you are digging for, you should not be digging. This is an extremely odd argument to make. Adherence to it in the archaeological community would stop archaeology in its tracks. It is doubtful that any of the great archaeological discoveries were made by persons who knew what they were about to find. 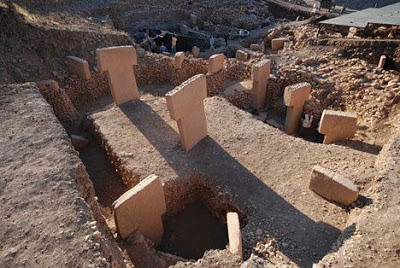 A shepherd dug around an odd-looking stone in Turkey and discovered Göbekli Tepe Ziyaret. Göbekli Tepe Ziyaret, near Urfa in southeastern Turkey. Robert Schoch believes, apparently, that it is a moral imperative that pyramid excavators not be the ones to discover fossilized organic material like leaves, because they are digging for stones. The digging for fossilized organic material, in Schoch's mind, should be left to those who are actually looking for fossilized organic material. But if Schoch is right that there is "a huge fossil biota just waiting to be uncovered," then why do we need to dig for it? The Great Schoch has used his Ground-Penetrating Razzmatazz (GPR) to create a new science: Clairvoyant Archaeology. 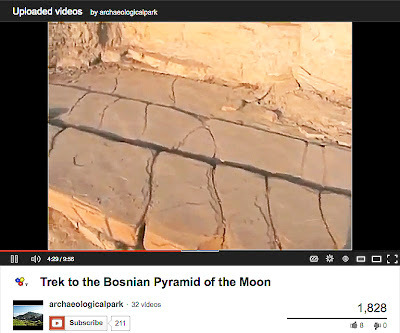 But disregarding Clairvoyant Archaeology and Ivy League razzmatazz, getting back to the simple rigors of science, rational persons agree that fossil leaf debris, or any fossils (or artifacts, for that matter), if they did indeed exist in the Visoko sedimentary layers, would be found by volunteers and archaeologists digging on the Bosnian pyramids project . . . but would not be found if digging did not occur. Schoch is willing to let that "huge fossil biota" wait a few years, decades, or centuries longer before being brought to light. Schoch's implication that anyone associated with the Archaeological Park project is automatically incompetent and would destroy such fossils is obviously outrageous. As an example of how outrageous the world of Dr. "Strangeworld" Schoch is, a world in which pyramid-seekers are "ignoring" and "destroying" fossils, here are two fossilized leaves discovered in 2012 by the Archaeological Park Foundation's team, led by Italian archaeologist Dipl. Cons. Ricardo Brett. and artificial concrete layers on the Bosnian Pyramid of the Sun in 2012. Although it is obviously too much to ask a Yale-educated scientist like Dr. Robert Schoch to provide evidence of the fossilized leaves he's talking about (we can take his word for that they exist, right? – after all, he's got a PhD from Yale! ), we, who don't have PhDs from Yale, have provided evidence of fossilized leaves. Who is "we"? We are the people who are actively engaged in archaeological research and actively engaged in the dissemination of archaeological facts. We distinguish ourselves from the anti-science Robert Schochs of the world, whose most prominent talents are muddying the waters of the crystal-clear river of science. 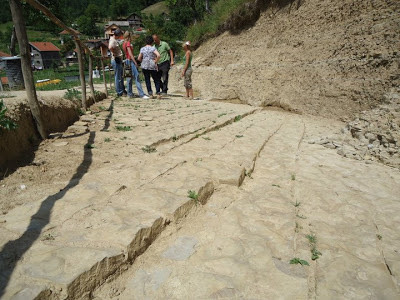 The Archaeological Park Foundation's team found this ancient organic material (two leaves) beneath a thick layer of unbelievably hard ancient artificial concrete, which itself lay beneath a layer of artificially laid pure clay, both material layers forming a daunting structure and Biblical-proportions floods-resistant covering for the entire Bosnian Pyramid of the Sun. How do we know that the clay was artificially laid on top of the artificial concrete? Because, as stated, the clay is pure. It has no organic material in it: no sticks, no leaves, no bones, no stones. When summer 2011 volunteers dig through the clay with picks and shovels and other implements, they never hit stones. This is documented on video. The fact that the Pyramid of the Sun's clay is pure, meter after meter as the team digs down, gives us proper and solid scientific evidence that clay ingredients were brought to the pyramid and mixed with water there by intelligent hands. How do we know that the concrete beneath the clay is artificial? 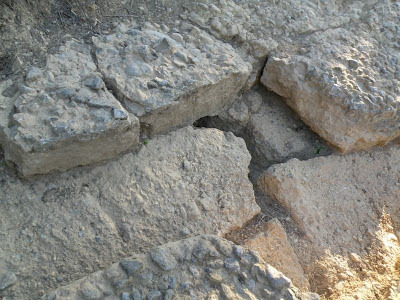 Because the ancient concrete is many times harder than modern-day concrete. Dr. Osmanagich sums it up in this July 4, 2011 video interview (start at minute 52:00): "The concrete that covers the Bosnian Pyramid of the Sun is 2 to 3 times better quality than our modern concretes in the 21st century. And it's measurable. We make concrete [today] which is in the range from 10 to 40 megapascals. That's the hardness. And this concrete on the Sun Pyramid is from 67 to 134 megapascals. . . . They [the ancients] had a better knowledge of those natural materials. . . . They applied certain formulas that we lost . . ."
Laboratory analysis tell us that the ancient concrete on the Bosnian Pyramid of the Sun was heated to a minimum of 500 degrees Celsius (932 degrees Fahrenheit). This is how you make concrete that will last, and this is how you make concrete that even a modern mechanical digger, which can break through granite, cannot break through. Vincenzo di Gregorio used to find hollow spaces beneath the ground. In June 2012, a team led by Archaeological Park's Dr. Niccolò Bisconti found organic material 75 centimeters below the surface of the Pyramid of the Sun embedded in an artificial concrete block laid many thousands of years ago by an ancient people unknown. The organic sample was tested and carbon-dated to 24,800 years old +/- 200 years. 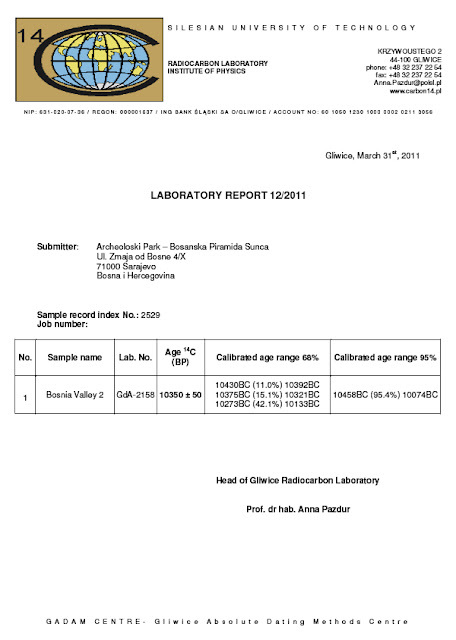 These results were published by the Archaeological Park Foundation on October 7, 2012.
embedded in one of the concrete blocks on the right. 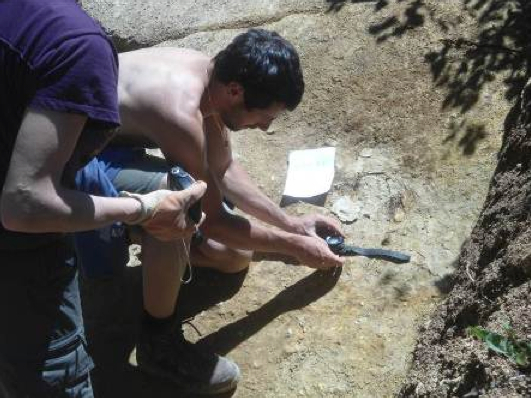 Dr. Niccolò Bisconti works with the organic sample found in the concrete block on the Bosnian Pyramid of the Sun. Unlike Dr. Schoch, scientists like Dr. Niccolò Bisconti, Dipl. Cons. Ricardo Brett, and Dr. Semir Osmanagich believe that evidence is required in the progress of science. They hold true to the bedrock principle of rigorous analysis before conclusion. Let's look again at what the good doctor Schoch "believes." 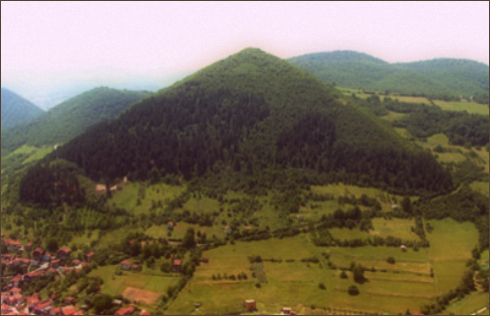 Let's take a quick look at one of Schoch's imaginary pyramids: the Bosnian Pyramid of the Sun. These excavations comprise what Robert Schoch derogates in his late-2006 letter to Science magazine as "pyramid-mania." (He also puts "excavations" in quotes.) 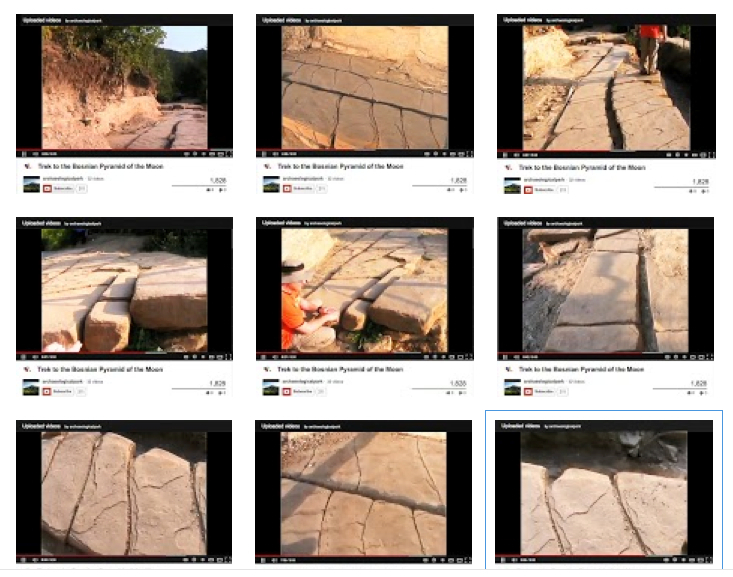 Notice that Schoch labels the "excavation" of ancient pyramids "mania" . . . but then refuses to use science to show that the pyramid project is the fevered hoax he claims it to be. Where is Schoch's geological analysis of the soil on the hills/mountains, to a depth of up to a meter? Where is his analysis of the clay layers that alternate with stone layers on the Pyramid of the Moon and sit atop five million tons of super-dense ancient concrete (harder than granite) on the Pyramid of the Sun? Where is his analysis of the (at least) two tunnel systems in the Visoko valley? Why is there no obvious attempt at scientific investigation associated with Dr. Robert Schoch's categorical denial of an ancient and highly sophisticated civilization in Bosnia? If geologist Dr. Robert Schoch doesn't believe in scientific investigation before scientific conclusion, then he doesn't believe in science. If he doesn't believe in science, what does he believe in? What comprises Robert Milton Schoch's mysterious belief system, his mysterious motivation, his mysterious agenda? Why is Robert Schoch pretending to be a scientist when he is quite obviously something else? Ravne tunnel labyrinth, August 2011. 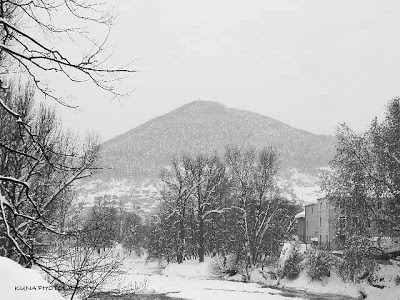 Robert Schoch writes: "While wondering (sic) the streets of Visoko, being offered all sorts of pyramid souvenirs, from tee shirts to copper plates bearing depictions of the Bosnian Pyramid of the Sun (stylistically rendered either as a stepped Mayan-style pyramid or, less frequently, as a smooth-sided Giza-style pyramid), I continued to hope against hope that I could find some 'truth' underlying the 'pyramid mania' that has gripped the region. One last possibility might be the evidence of the reputed tunnels found in the area that supposedly connect one pyramid to another. I had the opportunity to explore one tunnel that is currently open; to put it mildly, I was disappointed with what I saw. The tunnel had clearly been entered and modified in recent times, as evidenced by the graffiti found in places, the collapsed ceilings and walls, and the stories that the Yugoslavian army (Bosnia and Herzegovina was part of the former Yugoslavia) had once used the tunnels for military purposes, and possibly purposefully destroyed parts of them. If this was an ancient tunnel, it was difficult to tell now. The much-touted 'ancient inscriptions' seem not to be ancient at all. I was told by a reliable source that the inscriptions were not there when members of the 'pyramid team' initially entered the tunnels less than two years ago. 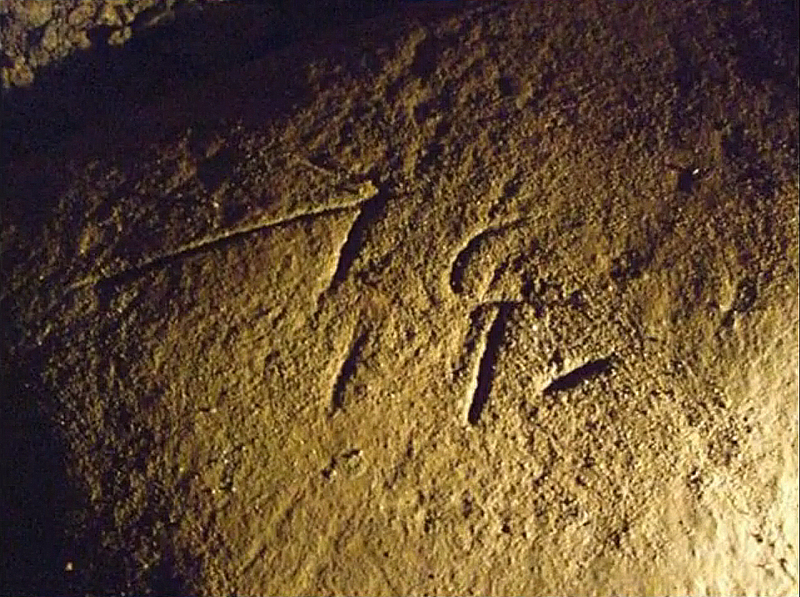 The "ancient inscriptions" had been added since, perhaps non-maliciously, or perhaps as a downright hoax. So, no pyramids . . . "
There are so many lies, obfuscations, and diversions in this single paragraph that it will take some time to get through them. As we'll see in the end, however, it's not Schoch's lies that matter. It's the complete absence of science in his "wonderings." One must wonder if his lies, his partial truths, and his stories are simply his ways of distracting readers from his lack of scientific conduct and (therefore) his lack of scientific results. The following extraordinarily long list of lies refers only to the above paragraph. Though not technically endless, Schoch's lies on his official website are legion, indeed epic. Readers are much safer, statistically speaking, to think that Schoch is lying about Bosnian geology, archaeology, and culture than telling the truth. That is an extremely bizarre and saddening thing to have to say about anyone. Lie #1: "While wondering (sic) the streets of Visoko, being offered all sorts of pyramid souvenirs . . ."
In Schoch's first painterly lie, he wants you to believe that, as he wanders the street of Visoko, business persons walk up to him and offer him pyramid souvenirs. The truth: Bosnian cultural values of modesty would never allow sellers to approach tourists with items for sale. Customers approach sellers. In his first lie, Schoch disrespects Bosnian culture. Lie #2: "I continued to hope against hope that I could find some 'truth' underlying the 'pyramid mania' that has gripped the region . . ."
Leaving aside for the moment the genuineness of his "hoping against hope" that he would find evidence of pyramids in Bosnia (he has given us no evidence that he tried), let's look at Schoch's claim that the town of Visoko was agog with "pyramid mania" in 2006. Even in 2011, when I spent 3 months in Visoko, there was no such thing that could be called "pyramid mania." If we go back in time five years to 2006, the vast majority of Visoko residents did not believe that they had been living their whole lives in the shadows of giant pyramids. If their cousins or brothers decided to sell pyramid souvenirs, they would simply be looked on as crazy (or, perhaps, in the post-war economy, very smart). 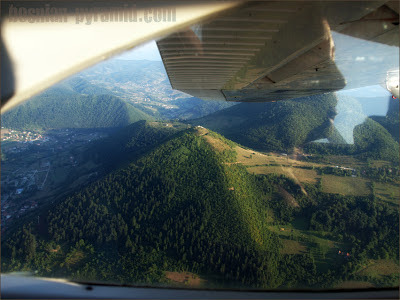 Most Bosnians even today have no interest whatsoever in the idea of Bosnian pyramids. To Bosnian natives country-wide, and to the vast majority of Visoko residents to this day, the pyramids look like forested mountains and might as well be forested mountains, and if by some chance they aren't forested mountains, what has that to do with them? Of the hundred or more Bosnians I met when I lived in Visoko for three months in the late summer and early fall of 2011, perhaps three had any interest whatsoever in talk of pyramids. But let's give Schoch the benefit of the doubt and say that 10% of Visoko residents actually care, today, about ancient pyramids and actually believe that ancient pyramids exist in or near the town of Visoko. In no sense does such a percentage mean, or in any way suggest, that "pyramid mania" exists in Visoko in 2012. Certainly it did not in 2006. The truth: If you want a blank stare, talk to a Visoko native about Bosnian pyramids. In Schoch's second lie, he disrespects Bosnian culture. Lie #3: "The tunnel had clearly been entered and modified in recent times . . ."
The truth: Schoch's lie here is his absurd implication that, in excavating an ancient tunnel, archaeologists would neither enter nor modify it. In his third lie, Schoch disrespects the discipline of archaeology and the scientific method. Lie #4: ". . . as evidenced by the graffiti found in places . . ."
The truth: No photographic, or other, evidence of (presumably modern?) graffiti has been offered to his readers by the good Dr. Schoch in over six years. 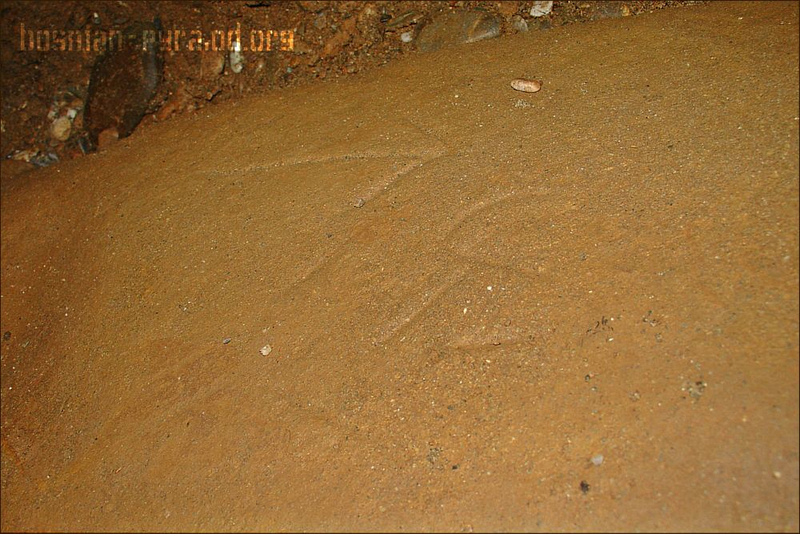 Schoch wants his readers to believe that, if he did indeed find modern graffiti at a site whose age has not yet been determined, that find would make it a modern site. This logic leads us to conclude that the Sphinx is modern because someone spray-painted its paw. In his fourth lie, Schoch disrespects the discipline of archaeology and the scientific method. Lie #5: ". . . the collapsed ceilings and walls . . ."
The truth: No photographic or other evidence of collapsed ceilings or tunnel walls has been offered to his readers by Dr. Schoch in over six years. Of course, any tunnel ancient or modern has a chance of collapsing. But the real lie here is that Schoch wants his readers to believe that a collapsed tunnel ceiling, or a collapsed tunnel wall, somehow makes a tunnel modern. In his fifth lie, Schoch disrespects the scientific method. Lie #6: ". . . and the stories . . ."
The truth: Stories are not science. Schoch's lie here is that stories without documented storytellers (legends) could somehow authentically and unequivocally date a tunnel system or anything else. Even stories with documented storytellers are not categorical evidence of anything. In his sixth lie, Schoch disrespects the scientific method. Lie #7: ". . . that the Yugoslavian army (Bosnia and Herzegovina was part of the former Yugoslavia) had once used the tunnels for military purposes, and possibly purposefully destroyed parts of them." The truth: Modern usage of an older site does not make that site modern. Schoch's lie here is that he wants his readers to believe that a tunnel system used for modern military purposes must be a non-ancient tunnel. In his seventh lie, Schoch disrespects the discipline of archaeology. Lie #8: "If this was an ancient tunnel, it was difficult to tell now." The truth: "Difficult"? Science is not now, nor has it ever been, concerned with the degree of difficulty of gathering evidence. 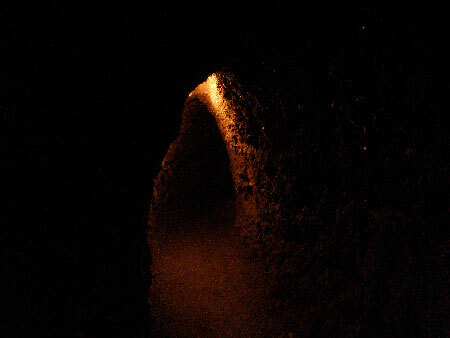 Schoch wants his readers to believe that the modernness of the tunnel was so obvious, and so overwhelming, that discerning ancientness was a task simply too difficult for him to undertake. In his eighth lie, Schoch disrespects the discipline of archaeology and the plain power of science in the hands of those willing to perform it. *** Please note ***: It would not be fair to criticize Dr. Schoch for concluding in 2006 that Ravne tunnel is not as obviously a work of the ancients as we know it to be today. In 2006, he would have had to get on his belly and squirm through it. Ravne tunnel is presently tall enough to walk through comfortably. My criticism of Schoch, as always in this article, is not criticism of his conclusions but criticism of how he arrives at those conclusions. Dr. Schoch is free, as all scientists are free, to conclude what he likes from the evidence at hand. The key questions are these: 1) Should reasonable persons take seriously a scientist who does not demonstrate to his readers that he is basing his conclusions on evidence? and 2) Should reasonable persons take seriously a scientist who, using conclusions not reached by the methods of science, attempts to deter, interrupt, or halt others' scientific inquiry, in this case by defamation, libel, and slander? Lie #9: "The much-touted 'ancient inscriptions' seem not to be ancient at all." "Seem"? What does seem have to do with science? Further, what ancient inscriptions? Why have photos of these inscriptions not been provided by the good doctor? Where is Schoch's interpretation of the inscriptions? Where are the interpretations of the inscriptions by other scientists? Why is he not both providing and critiquing evidence? What is he talking about? The truth: Schoch's lie here is that he wants his readers to believe that, simply by looking at inscriptions (in which tunnel? where? in what kind of stone? ), he can tell with reasonable accuracy that the inscriptions in question are, without any doubt whatsoever, "graffiti." In his ninth lie, Schoch disrespects the rigorous discipline of science and every scientist who has ever applied, or ever will apply, the scientific method to the natural world or to artificial structures or artifacts. In his ninth lie, Schoch disrespects the discipline of archaeology and the analytical power of science. Lie #10: "I was told by a reliable source that the inscriptions were not there when members of the 'pyramid team' initially entered the tunnels less than two years ago." The truth: Science has no interest whatsoever in what a scientist was told. Schoch 1) heard a story and 2) tells us that the story's anonymous teller is reliable without telling us how this reliability is concluded. But science 1) has no interest in a story as conclusive evidence of anything and therefore 2) has no interest in the reputation of the story's teller. Schoch's lie here is that he wants us to believe that gossip – in this case, undocumented gossip – equates with evidence. In his tenth lie, Schoch disrespects science, which relies on evidence, not tales. Lie #11: "The 'ancient inscriptions' had been added since, perhaps non-maliciously, or perhaps as a downright hoax." The truth: No scientific method of any kind was employed by Schoch, and scientists to this day have no idea what tunnels he was talking about or what stones he was talking about, if any. 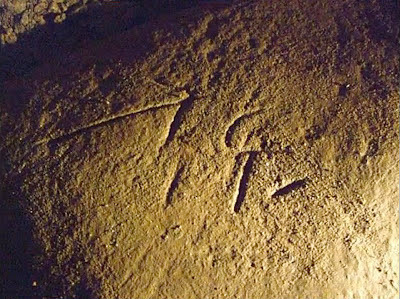 Schoch wants us to believe that, as a scientist, he has used the scientific method to conclude that the inscriptions in question are without any doubt whatsoever modern inscriptions, i.e., "graffiti." (Why does he want us to believe that? Why does he think we will believe that if he does not provide evidence?) In his eleventh lie, Schoch disrespects science. Lie #12: By saying that inscriptions "had been added since, perhaps non-maliciously, or perhaps as a downright hoax," Schoch wants us to believe that Dr. Semir Osmanagich, whose body of work and dedication to the scientific method marks him as a true scientist, was either 1) fooled by modern graffiti or 2) purposely used modern graffiti to fool others. Let's look at the first possibility in detail and leave the second possibility to the courts, if Schoch is ever sued by Dr. Osmanagich for libel. The truth: Regarding the inscriptions in question, Dr. Osmanagich asked researchers expert in the field of recognizing and deciphering ancient inscriptions to join the team of archaeologists working on the Archaeological Park project in Bosnia. Here is the testimony of two of those experts. 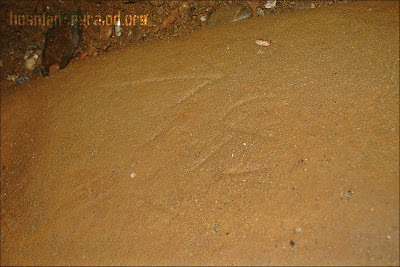 Friedrich Klára writes in "Old English Runic Writings and Symbols in Bosnian Ravne Tunnel?" The above photos were taken of the surface of Megalith K-1, an artificially constructed (ceramic) megalith excavated in Ravne tunnel from beneath approximately two meters of loose sand and rivers stones ("fill-in material"). What is "fill-in material"? It is the material that was brought in to fill Ravne tunnel to the brim, except for the water side-channels, either by the culture that built the tunnel or, more probably, by a later culture. Volunteers transport the "fill-in material" outside, wheelbarrow by wheelbarrow, cart by cart, and deposit it across the road so that archaeologists and volunteers can inspect it for artifacts, organic material, or anything else unusual. Lie #13 : So, no pyramids . . ."
Science does not allow unsupported conclusions. Schoch wants us to believe that, because he believes (without evidence) that the "tunnels" (which tunnels? 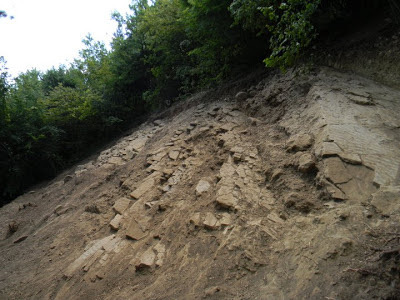 he doesn't tell us) in the Visoko valley are not ancient, therefore no ancient pyramids exist in the Visoko valley. Notice that Schoch does not say something like, "The absence of ancient tunnels strikes a blow to the pyramid hypothesis," or something that a real scientist might say. He simply makes a conclusion, without evidence, based on another conclusion that was also made without evidence, and his conclusion is categorical. 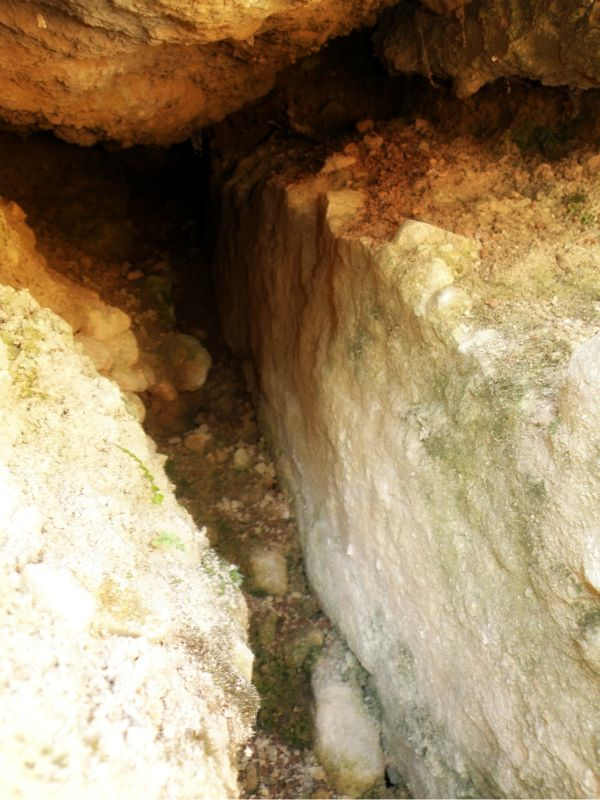 The truth : 1) At least two ancient tunnel systems exist in the Visoko valley in Bosnia, and 2) they are both associated with the ancient pyramid complex that exists there. In his thirteenth lie, Schoch disrespects science. The two tunnels systems in the Visoko valley are startlingly different. Our good Dr. Schoch never mentions this most basic of facts. The two startlingly different tunnel systems have names. Dr. Schoch does not use these names. I will use them now. The two tunnel systems discovered and documented so far in the Visoko valley are the KTK tunnel system and the Ravne tunnel system, or Ravne tunnel labyrinth. The fact that Schoch starts off his meandering musings with the word "tunnel" and ends up with the word "tunnels" is shocking, but not surprising considering his (lack of) method thus far. The fact that Schoch never names the tunnel system he is talking about leads us to believe that he does not know the tunnels' names. Further, it leads us to suspect that he is not a scientist on an expedition to dig up facts but a person with a personal agenda, which may in fact be simply to take a vacation. A scientist (a real scientist, one who follows the scientific method) would absolutely tell us which tunnel system he was referring to, he would absolutely provide photos of the tunnel(s) in question, he would absolutely provide quotes from, and links to, other scientists' writings on the tunnel(s) in question, he would absolutely provide photos of the "graffiti" in question, and he would absolutely provide quotes from, and links to, other scientists' writings on this alleged "graffiti." Instead, the good Dr. Schoch offered nothing whatsoever in the form of evidence or other scientists' corroborative testimony or data to back up his categorical denial of 1) an ancient pyramid complex-related tunnel network in Visoko, Bosnia and 2) ancient writings on, in, or near one or more of the tunnel networks. Yes, it's true. 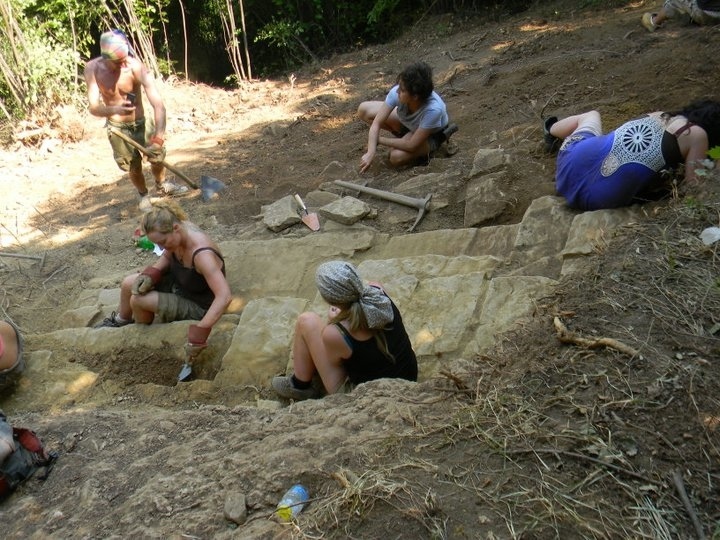 Before accusing the Archaeological Park Foundation of fraud, before publicly defaming Dr. Osmanagich, Dr. Schoch never even engaged the very basics of preliminary research performed by scientists on the structures in and near Visoko. This is a shameful record for someone who calls himself a scientist. In the more than six years since Schoch published his faux-science vacation log, he has never (not once) engaged any of the massive amounts of scientific data pouring like a fountain out of the Visoko valley. Scores of scientists in the fields of archaeology, geology, engineering, mining, archaeoastronomy, physics, anthropology, history, and more have published papers on the Bosnian pyramids, Ravne tunnel, and related subjects, and Dr. Schoch has remained ever-silent on this tide of data. 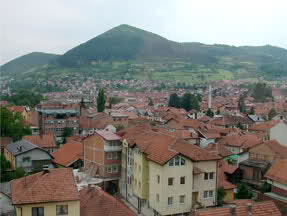 "[In 2005], I came to a central Bosnian town called Visoko. It's about 25 kilometers from the capital of Sarajevo. And I noticed a couple of peculiar hills. They had the perfect geometry of pyramids. When I put the compass to it, I noticed that the four sides of the hills are perfectly aligned with the cardinal points: east, west, north, south. . . ."
". . . And based on my experience with the pyramids in the world, and I have seen hundreds of them, I knew immediately that these are not natural hills but man-made objects covered by soil and vegetation. It was two years ago, in April of 2005. So I decided to fund, myself, the first geological surveys. And what I found out was that, on those two hills, there existed a bunch of blocks and plates shaped by man. Then we applied a lot of high-tech techniques, like satellite imagery, thermal analysis, radar analysis, topographic surveys. And each one of them confirmed that, really, the man-made objects, the huge colossal structures made of stone, do exist under the layers of soil. 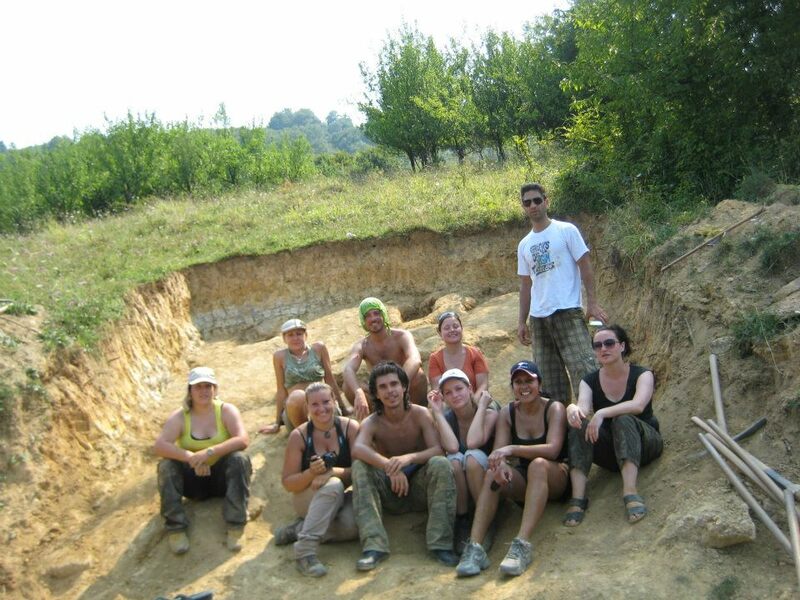 So finally, in April 2006, we started the biggest geo-archaeological project in the world. Last year only we spent more than 150,000 working hours digging and excavating on those couple of hills. We call them now the Bosnian Pyramid of the Sun and the Bosnian Pyramid of the Moon. . . . In the case of the Bosnian Pyramid of the Sun, we are finding huge megalithic blocks: they are 7, 8, or 10 tons in weight. 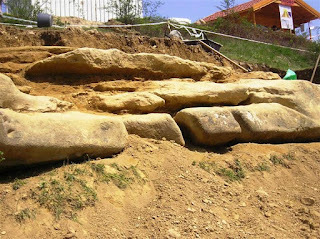 In the case of the Bosnian Pyramid of the Moon, we are finding the complex of terraces, built out of the sandstone plates and blocks. 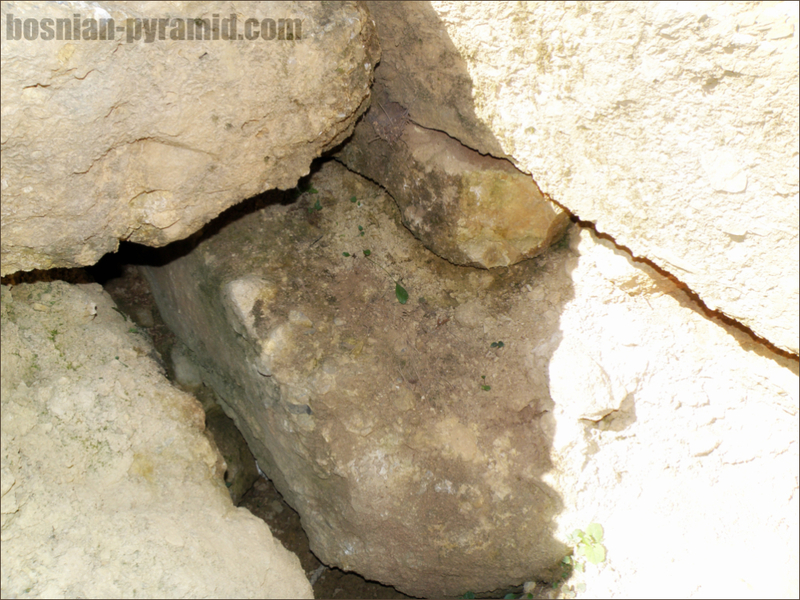 And finally, we have the complex network of underground tunnels that connect all the pyramids. 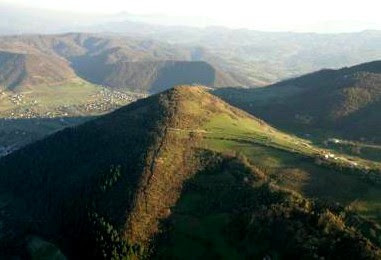 And we have a total of five objects in the valley, which are called the Bosnian Valley of the Pyramids. So really we have all the elements, like other pyramidal complexes: We have perfect geometry, we have perfect alignment to the cardinal points, we have four triangular sides, we have the network of the tunnels. And I must say, even though we are at the beginning of our research, that what we are finding is truly exciting. In the last year only, we had more than 250,000 visitors and tourists who came to see what we are researching here in central Bosnia." Professor of Egyptian archaeology Dr. Nabil Swelim, owner of three PhD titles in Archaeological Sciences and one of the world's leading Egyptologists, confirmed the man-made nature of the Bosnian pyramids in 2007. 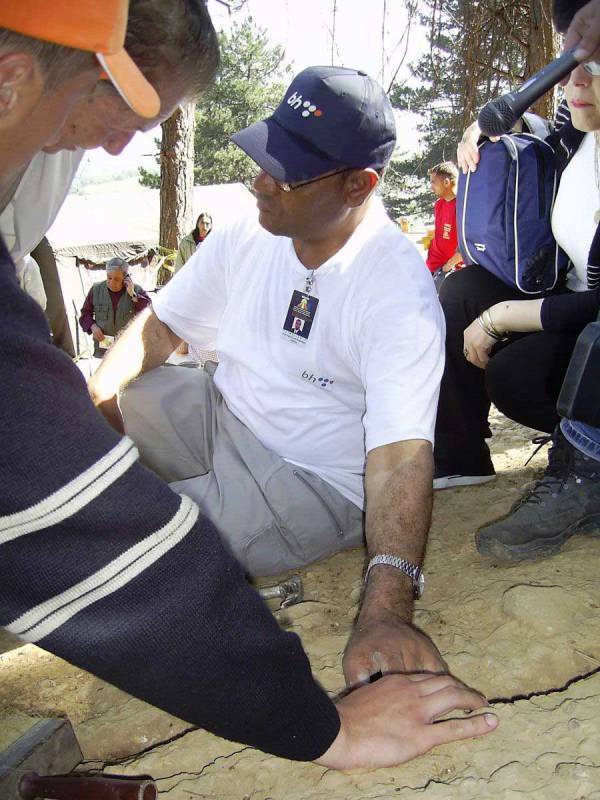 Dr. Nabil Swelim (middle) inspects ancient concrete on the Bosnian Pyramid of the Sun. From August 25-30, 2008, Dr. Swelim presided over the first International Scientific Conference on the Bosnian Valley of the Pyramids, linking his name and reputation forever with the Bosnian pyramids hypothesis. 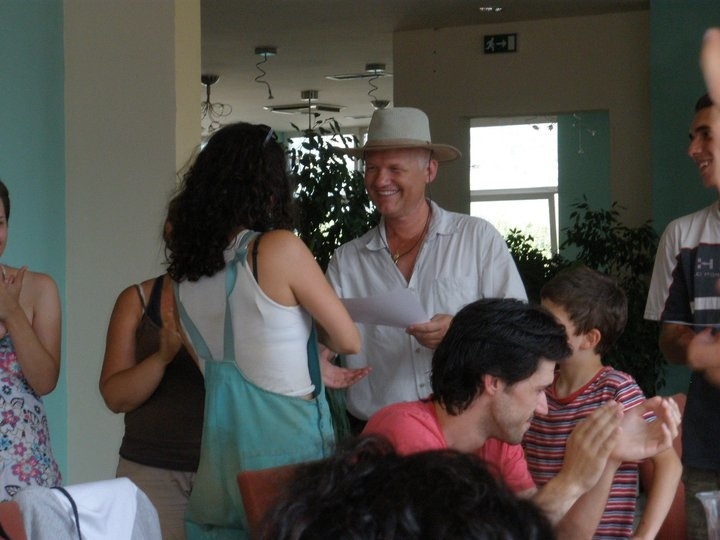 At the press conference in Visoko on August 25, 2008, Dr. Swelim stated: "The Bosnian Pyramid of the Sun is the largest pyramid ever witnessed. It is an amazing structure of great importance to the entire world. . . . This is an amazing discovery and it is going to take us a lot of time to figure all this out, meaning how these fascinating structures were built." Fifty-five conference participants from 13 countries concluded that Bosnian Valley of the Pyramids was "an archaeological location." And two years before, Egyptian geologist Dr. Aly Barakat had already spent 42 days researching the Bosnian Pyramid of the Sun and the tunnels of the Visoko valley, and had concluded, with Dr. Swelim, that these were not natural features but structures made by intelligent hands. "Who is Dr. Aly Barakat," you ask, "and why should I value his opinion about pyramids?" This is a good question, and it is a question that persons with open and inquiring minds naturally ask. Here is the answer. is a geoarchaeologist and geologist from the Egyptian Mineral Resources Authority in Cairo, Egypt and a member of the Egyptian Geological Survey. 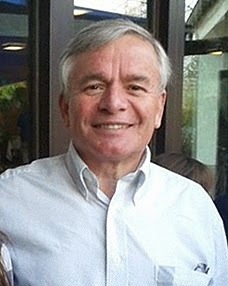 In May 2006, he was sent to Bosnia by then Minister of Egyptian Antiquities, Zahi Hawass, who had been asked by the Egyptian government, at Dr. Osmanagich's request, to send an Egyptian geoarchaeological expert to weigh in on the Bosnian pyramids hypothesis. Dr. Barakat was specifically recommended by Dr. Hawass (though later Hawass denied recommending him), and Dr. Barakat came to Bosnia in May 2006 and performed his requested duties. On June 25, 2006, two days after Dr. Barakat stated in his written report that the Bosnian Pyramid of the Sun was "man-made," Dr. Hawass held a press conference during which he stated: "There aren't pyramids in Bosnia, just a pile of stones. Blocks weighing 30 tons are natural. Barakat is no pyramid expert and Osmanagic is hallucinating." The methodical investigations performed by three true scientists, Dr. Swelim, Dr. Barakat, and Dr. Osmanagich, fell on the intentionally deaf ears of the archaeological orthodoxy. In his article, " The First International Scientific Conference on the Bosnian Pyramids," Philip Coppens writes that "heavyweights of archaeology had concluded that the structures near Visoko were manmade . . . [and this was] announced to the world in 2007, after a visit to the "Bosnian Valley of the Pyramids" by Dr. Nabil Swelim. Unfortunately, hardly anyone in the West has taken note of this, though the unscientific dismissals of the likes of Anthony Harding, Robert Schoch and some [others] continue to circulate and influence thinking. Indeed, it is clear that [Schoch, Harding, and others who dismiss the Bosnian pyramid hypothesis] have no room for the paradigm shift that the man-made nature of these structures will bring about." Science always has an uphill battle with belief and with self-interest. What does Dr. Schoch present, if anything, as scientific evidence for his claim that ancient pyramids in Bosnia are, in fact, natural hills or mountains? How does he combat the copious amounts of scientific data produced by Dr. Swelim, Dr. Barakat, Dr. Osmanagich and their associates? In the last six years, has Dr. Schoch been able in any way to back up his accusations of scientific misconduct and scientific fraud on the part of Dr. Osmanagich's Archaeological Park Foundation? The largest documented pyramid in the world stands beneath a calm sky. The Bosnian Pyramid of the Sun, covered with trees and other vegetation. On its right (western) face, we see its access ramp. 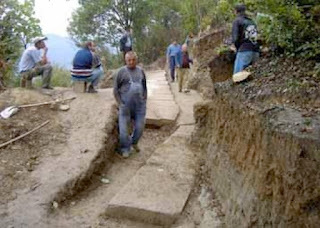 On the right of the largest documented pyramid in the world is a smooth, exceedingly flat (comfortably traversable) access ramp built by the ancients, either from an existing hill or from newly brought material. On the bottom left of the pyramid, we see a small slice of the much smaller Bosnian Pyramid of Love, which stands southeast (in the background) of its much larger companion. The Bosnian Pyramid of the Sun stand 220 meters tall and at this height is one-third taller than the Great Pyramid in Egypt. It is also much more massive than the Great Pyramid. To support its phenomenal height, the ancients gave significantly more slope to the Pyramid of the Sun's sides. The slope angle of the Great Pyramid is 51 degrees, 51 minutes, and 14.3 seconds (also written as 51.51 degrees) for all four sides. The slope angle of Bosnian Pyramid of the Sun is 43.822, or more accurately is 43.822 degrees +/-1.6 degrees, for all four sides. This makes for a much more massive pyramid, because the base in necessarily far larger than that of its Egyptian cousin's steeper-sloping sides. 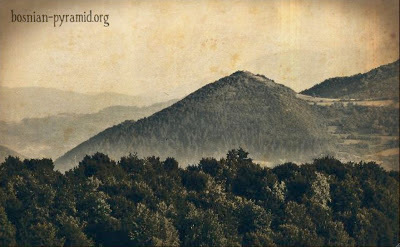 On Robert M. Schoch's old official website, there is a picture of the Bosnian Pyramid of the Sun taken from the west. The pyramid's western face, as we have noted, is where the pyramid's access ramp is located. The caption of the pyramid photo, or more properly the access ramp photo, on Schoch's old official site is: "'Pyramid of the Sun' - Does this look like a pyramid?" This photographic angle and distance, from the west and close up, is one of the very few angles from which one might view the Pyramid of the Sun and not see its pyramidal shape: its straight sloping edges and triangular faces. I won't use the good doctor's photo here, because it has RMSCMD (Robert Milton Schoch and Colette M. Dowell's initials) forbiddingly stamped on it. However, I just happen to have two very similar photos, which I have titled, with intended humor, "Access Ramp - Does this look like a pyramid?" Access Ramp - Does this look like a pyramid? The two photos above were taken from approximately 75 yards farther away from the summit than Schoch's photo. of the Bosnian Pyramid of Love. and, behind that, the concave Temple of Mother Earth. Temple of Mother Earth directly behind it on the far left. and a good portion of the Temple of Mother Earth on the far left. 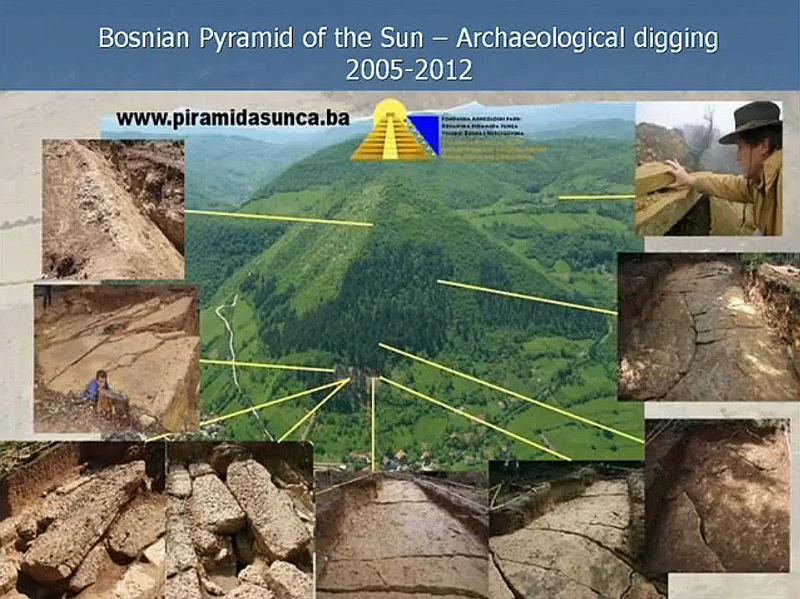 face of the Bosnian Pyramid of the Sun. we see the western face of the pyramid most prominently. Pyramid of the Sun closest to us on the right. The above photo is a screen-grab of footage from a "History Channel" documentary, aired December 21, 2012, about pyramids around the world. In the photo above, we are looking south. 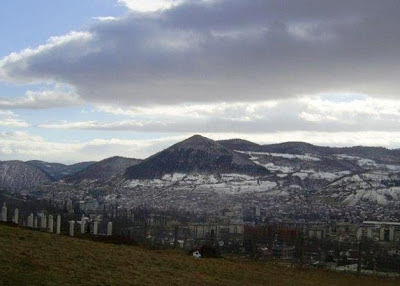 The Bosnian Pyramid of the Sun, the largest documented pyramid in the world (1/3 taller than the Great Pyramid of Egypt), is in the foreground on the right. Its north face is toward us. Behind the Bosnian Pyramid of the Sun is the smaller Bosnian Pyramid of Love. In the center of the photo toward the back is the concave, crescent-shaped Temple of Mother Earth. On the left is the Bosnian Pyramid of the Moon, which looks small in this photo but is still taller than the Great Pyramid of Egypt. 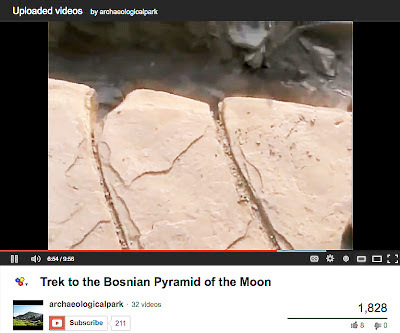 I wonder if it is a coincidence that the only other major non-academic public critic of the Bosnian Pyramid project, Colette Dowell, Schoch's old friend and the anonymous "Irna," has for her site's primary photographic evidence of a Bosnian pyramid "hoax" a photo of the access ramp of the Bosnian Pyramid of the Sun. Why is it, do you think, that Colette Dowell wants you to believe that a small and unremarkable hump is all there is to the Bosnian Pyramid of the Sun? What motivates a prolific anonymous and non-anonymous libeler of the Archaeological Park Foundation, and of Semir Osmanagich himself, to reduce the largest documented pyramid in the world to a modest mound of earth with shrubbery on it? 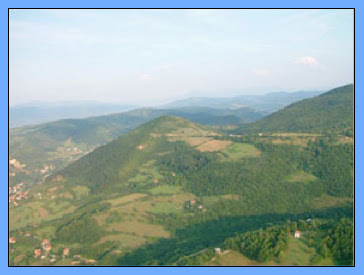 What sort of thoughts does one imagine are running around the brain of someone who has spent the last seven years of her life trying to document a Bosnian pyramids hoax, while at the same time she defrauds her readers from the very first image on her site? What sort of individual expects readers to take an anonymous author seriously? What sort of individual, writing anonymously about a subject about which she wrote non-anonymously, believes that her "style of speech" won't allow people to uncover her identity? Why does Colette Dowell think people are stupid enough to take her seriously? 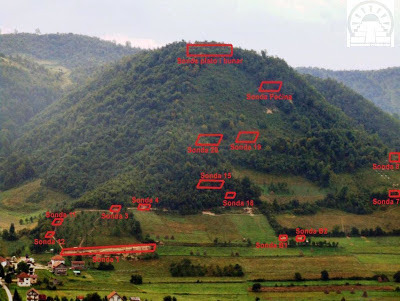 Dr. Semir Osmanagich and hundreds of scientists who have written papers on these pyramids and the tunnel systems associated with them, have shown unequivocally that ancient pyramids do exist in Bosnia. In fact, Dr. Osmanagich has said since 2007 that he is no longer trying to show that pyramids exist in Bosnia but to find out what they are for. 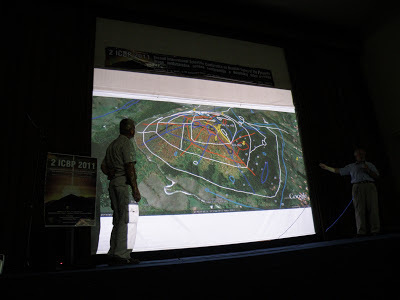 I personally introduced the Second International Scientific Conference on the Bosnian Pyramids in September of 2011. (The First International Scientific Conference was in 2008). 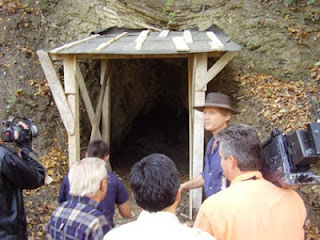 Between video interviews with the scientists speaking there, I listened for three days as real scientists provided their findings on different aspects of pyramids in and near the town of Visoko, Bosnia. None of the 22 scientists, authors, and researchers who spoke at this conference tried to prove that pyramids exist in Bosnia. 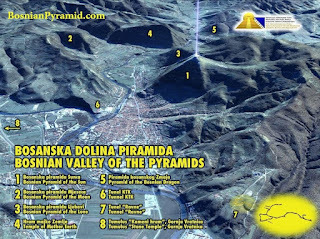 All of the scientists simply presented their findings on one or more phenomena of existing pyramids or Ravne tunnel labyrinth or other features of the ancient pyramid complex in the Visoko valley. Like all sciences, archaeology is split into two main groups: 1) the orthodoxy, who focus on what they stand to gain from the scientific status quo (these are primarily academics) and 2) the scientists, who focus on discovery according to the dictates of the scientific method. The archaeological orthodoxy presently has humanity by the throat. It tells us, very lovingly, that civilization is young and that the history of humankind is the relatively recent epiphany in our species' collective brain that one can grow crops instead of wandering around throwing spears. Oh yes, and along the way, a few kings had slaves who were very good at dragging megalithic blocks up ramps to build colossal tombs for egotistic royalty. This nonsense is actually taught and believed. 1. 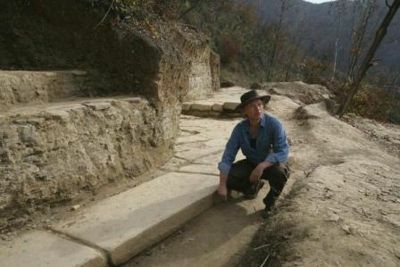 Anthony Harding - Professor of Archaeology. Former President of the European Association of Archaeologists (2003-2009). Chairman of the Archaeology Section of the British Academy. A ruthless champion of the scientific orthodoxy. 2. Claudia Valentino - Editor-in-Chief, Archaeology magazine. Has inherited, and continues to be responsible for, a seven-year Archaeology magazine moratorium on Bosnian archaeology. 3. Robert Schoch - Popular speaker and author on ancient civilizations. A reckless libeler and slanderer whose soft-spoken speaking style, along with his ill-gotten fame, allow him to continue touring ancient sites on other people's money. 5. Curtis Runnels - Professor of archaeology at Boston University and editor of the Journal of Field Archaeology. Runnels joined the fray early on in a 2006 National Geographic News article, stating: "Mr. Osmangic (sic) offers no concrete physical evidence to support his claims, despite the fact that they are fantastic. . . . 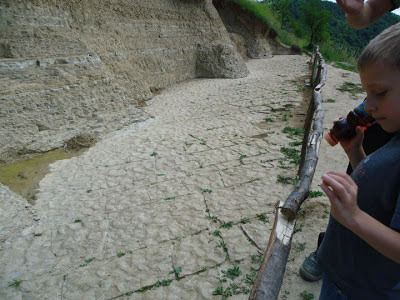 The [Visoko] area was in fact occupied by Upper Paleolithic hunter-gatherers with a Stone Age technology sufficient for building fires, tents, and simple hunting implements like bows and arrows. They were not pyramid builders." Runnels graciously replied on January 10, 2013 to my email query of the same date with the following reiteration: "These natural hills have nothing to do with pyramids. There have been no new data to change this conclusion." (Quoted by permission.) Runnels is a full-fledged propitiate of the archaeological orthodoxy and therefore a continuing danger to science. 6. Joshua Foer - An established and extremely adept writer, co-founder of the Online Guide to the World's Wonders & Curiosities. Turned his acute and fertile mind to the destruction of Semir Osmanagich's archaeological endeavors in Bosnia in 2007. Will probably hop over to the side of science soon on this issue. 7. Colin Woodard - Wrote two articles attempting to turn the story of the discovery of ancient pyramids in Bosnia into the tale of a hoax. Here is Woodard's description of Semir Osmanagich, whose PhD is in the history of civilizations and who has written ten books on pyramids around the world: "Semir Osmanagic, a Bosnian-American metal-shop owner in Houston and self-described 'alternative historian'" . . . Woodard, a skilled juggler of the facts, is dangerous to science, though it's doubtful that he'll have the chutzpah to come out a third time against ancient pyramids in Bosnia, in light of the Foundation's awesome and continuing record of archaeological discovery. 8. John Bohannon - A journalist whose style of reportage was plainly echoed by Colin Woodard (above). In his hit-piece, "Mad about Pyramids," Bohannon describes Dr. Osmanagich as "a Bosnian businessman who runs a construction company in Houston, Texas . . ." Bohannon somehow left out Dr. Osmanagich's PhD in the history of civilizations and his 10 books on pyramids around the world. Bohannon is a skilled journalist, a TED Talk speaker, and a continuing danger to science. 9. Colette Dowell, aka the anonymous "Irna" - A silly but unfortunately prolific woman with emotional ties to persons bent on suppressing Bosnian archaeology and the true history of humankind. A continuing danger to science. 10. Mark Rose - Former Online Editorial Director for Archaeological Institute of America (which also publishes the unrepentantly orthodoxical Archaeology magazine), co-author of the 2010 "Great Discoveries in Archaeology: The Past Revealed." A minor figure on the scene, but with continuing potential to do harm to science. 11. 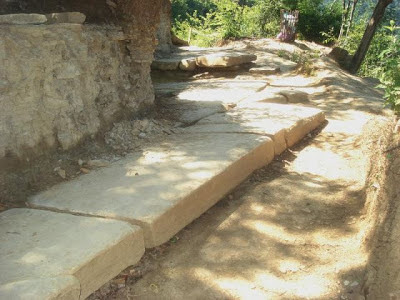 Garrett G. Fagan - An academic figure somewhat careless with his words, Fagan, professor of ancient history at Pennsylvania State University, with an interest in "archaeological method," states in "Pyramid in Bosnia – Huge Hoax or Colossal Find?" National Geographic News, May 12, 2006 (re-quoted from the London Times): "It's as if someone were given permission to bulldoze Stonehenge to find secret chambers of lost ancient wisdom underneath." Professor Fagan is a continuing danger to science. 12. Tera C. Pruitt - A tangential academic figure whom the scientific world may never hear from again. However, Pruitt's academic background, her passion for fantasy, and her acute talent for the extreme misuse of facts in the steering of reality toward her personal agenda, all make her pretentious dismissal of ancient pyramids in Bosnia, and her unctuous insinuations of hoax, more of a bedrock for future calumny than a one-off. She begins her article with the standard biographical omissions used like a rubber-stamp by the archaeological orthodoxy: "In 2005, a businessman and alternative historian named Semir Osmanagić . . ." And off she goes. A continuing danger to science. 13. Robert Steven Bianchi - Author, editor, documentary consultant, and contributing editor to Archaeology magazine. Sycophant to the archaeological orthodoxy and therefore a continuing danger to science. 14. 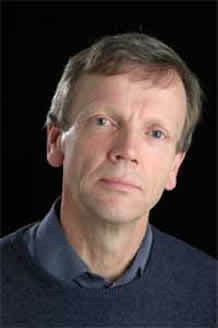 Alun Salt - Archaeoastronomer associated with Leicester University. 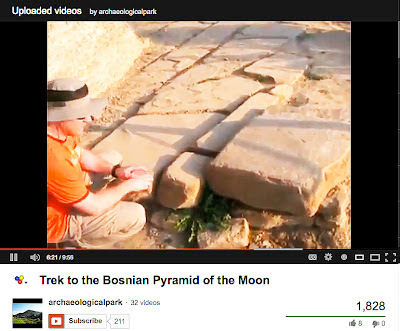 No significant writings to date, beyond his original hit-pieces, "Bosnian Pyramids?" and "The Bosnian Pyramid Threatens to Spread." Still a danger to science because of his profession and his continuing association with Leicester University, which may make people believe that he has something worth listening to say on the subject of Bosnian pyramids. 15. 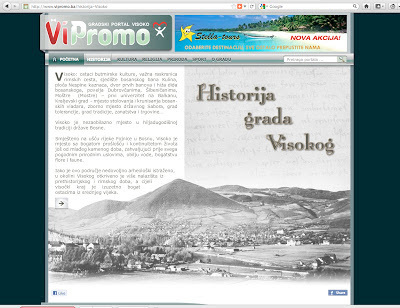 Vassil Nikolov - One of the original signers of the Declaration against the Bosnian pyramids project. Now discredited because of charges of criminal corruption. 16. 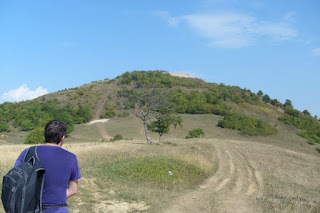 Vuk Bačanović - One of the early detractors of the Bosnian pyramids hypothesis, this then-22-year-old native's ad hominem enthusiasms (attacks on the characters of both Dr. Osmanagich and Dr. Nabil Swelim) were picked up and amplified by other Bosnian pyramids detractors who had little other material to work with. However, although Bačanović has written at least one other article since then, he has not been published on the subject of archaeology since his original February 8, 2008 outburst in the Sarajevo news magazine Dani. 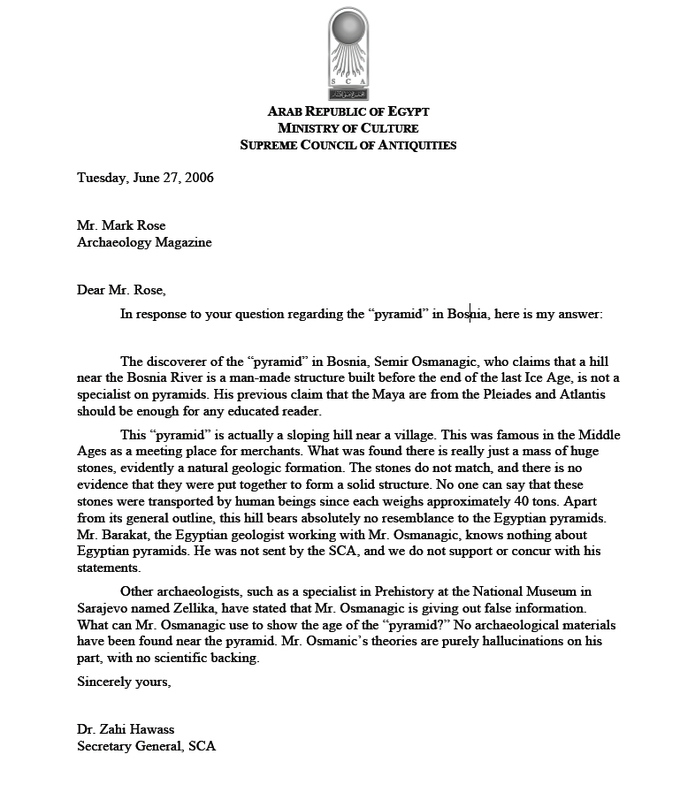 Zahi Hawass's June 27, 2006 letter to Mark Rose. 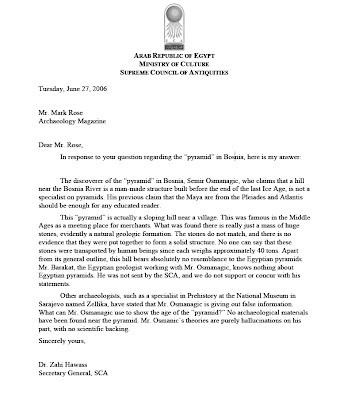 "With revolution in Egypt it wasn't possible to hide 1.600 documents that demonstrate that Dr. Zahi Hawass stole precious artifacts, falsified historical findings (making them appear younger than they really are, because they didn't fit into official history), and fired archeologists, Egyptologists, guides and state officials, who spoke loudly about corruption of his office." Although Zahi Hawass, like Vassil Nikolov above, will never be able to recover whatever scientific credibility he might once have had, he is still quoted by the archaeological orthodoxy as an authority on the absence of pyramids in Bosnia. This is actually quite humorous, as it shows clearly the full-on insanity of the archaeological orthodoxy, which normally manages to exhibit a modicum, more than a modicum, of rationality. With these handfuls of orthodox archaeologist and hamster-wheel journalists hell-bent on running in circles, with only a few degreed non-criminals left to take Schoch's side in his attack against archaeological sanity, we come again to the question we started with: What in Amun's name is Robert Schoch thinking, doing, and planning? Why does Robert Schoch believe, with Archaeology magazine, and with the discredited Zahi Hawass, and with the discredited Vassil Nikolov, and with the orthodox academics who have never been to Bosnia but who shout from their armchairs that ancient pyramids are absent from this fertile pyramids-stuffed valley . . . why does the good doctor Schoch believe that pyramids, which are manifestly pyramids, are not pyramids? Perhaps Dr. Schoch has taken his cue from the "Pharaonic" Zahi Hawass. Or perhaps our good doctor Schoch has taken his cue from another veteran of scientific suppression, Professor Anthony Harding. "'Not any evidence at all has been found' to support the claim the site would be an archaeological site, he said. 'I've seen the site, [and] in my opinion it is entirely natural.'" . . . When asked to comment on Harding's statement, Mario Gerussi, the director of Osmanagic's team leading the excavations, said the team had not been informed of the timing of Harding's visit and that none of the staff at the site had seen him there." "It adds insult to injury," Harding writes in a letter to the London Times (April 18, 2006) "when rich outsiders can come in and spend large sums pursuing their absurd theories (the construction of a colossal pyramid so large that it dwarfs even those of Egypt or Mesoamerica? 12,000 years ago? ), in ways that most other countries would never countenance, instead of devoting their cash to the preservation of the endangered genuine sites and monuments in which Bosnia-Herzegovina abounds. And the cause of protecting that heritage is also diminished when a publication that prides itself on being a newspaper of record devotes a whole page spread to such nonsense." Anthony Harding's sole evidence to claim that pyramids in don't exist in Visoko, Bosnia? Here it is: "I visited the 'pyramid' together with Predrag Novakovic and Sylvie Květinová [a secretary and an administrator] on 8 June , and we confirmed that the stone exposed is of entirely natural origin." 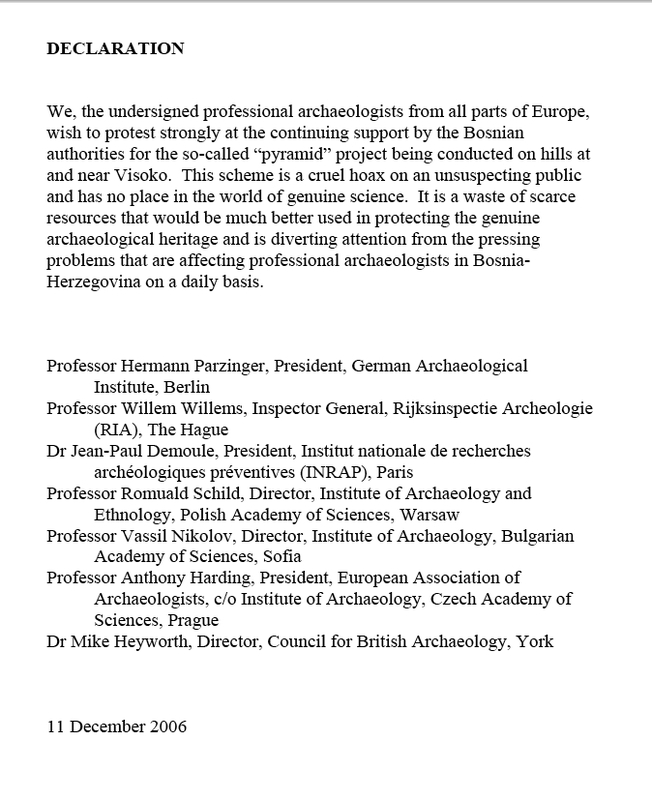 "DECLARATION - We, the undersigned professional archaeologists from all parts of Europe, wish to protest strongly at the continuing support by the Bosnian authorities for the so-called "pyramid" project being conducted on hills at and near Visoko. This scheme is a cruel hoax on an unsuspecting public and has no place in the world of genuine science. 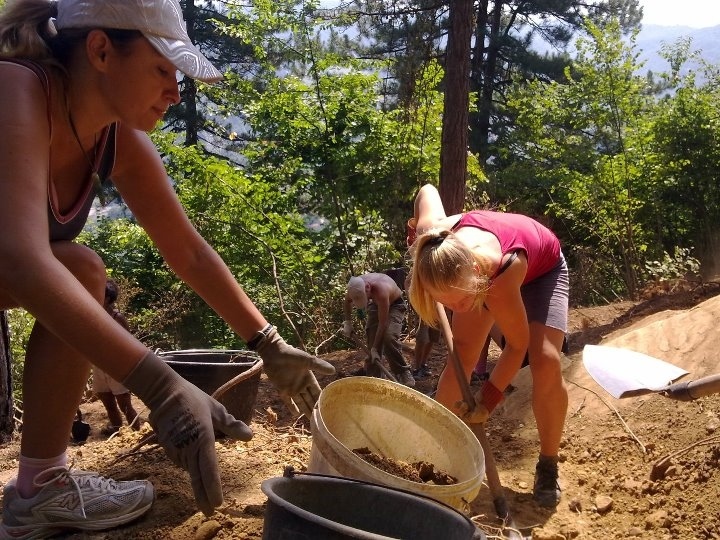 It is a waste of scarce resources that would be much better used in protecting the genuine archaeological heritage and is diverting attention from the pressing problems that are affecting professional archaeologists in Bosnia-Herzegovina on a daily basis. 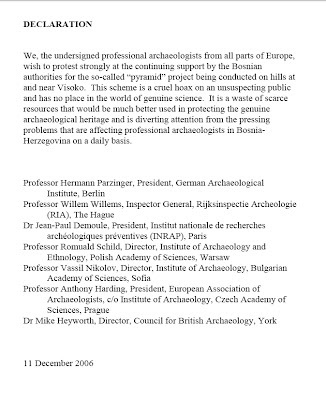 Dr Mike Heyworth, Director, Council for British Archaeology, York 11 December 2006"
Interestingly, before signing the above Declaration, none of the archaeologists except for Harding visited the site. Concerning his visit to the site, Anthony Harding himself stated that 1) he did not contact the archaeological team before his arrival, 2) he did not ask anyone on the Foundation's archaeological team to be shown the relevant digs and/or artifacts, and 3) he did not meet with anyone who could have shown him the relevant digs and/or artifacts. 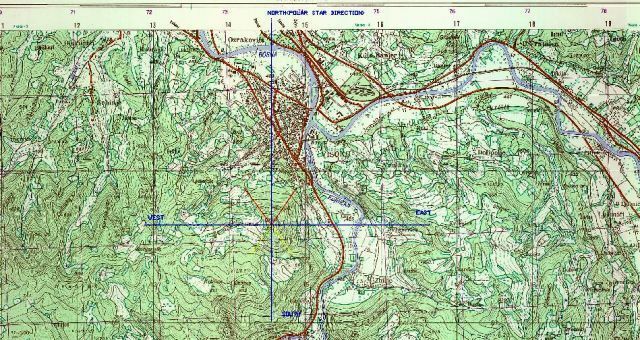 To this date, Harding has provided no photographic evidence to back up his claim that he visited the site, and Harding has provided no photos or data to support his public conclusion on the pyramids hypothesis in Bosnia, a conclusion which, very oddly, he asks us to believe is "scientific." In short, Harding embarrassed both himself and his profession by stating unequivocal negative conclusions about pyramids in Bosnia after spending a reported 15 minutes in Visoko. 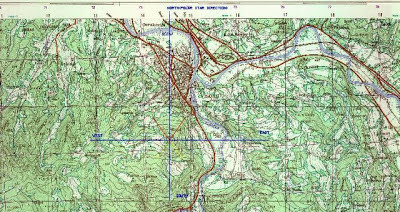 Anthony Harding's entire documented evidence that ancient pyramids do not exist in the Visoko valley is . . . nothing. There is no evidence. 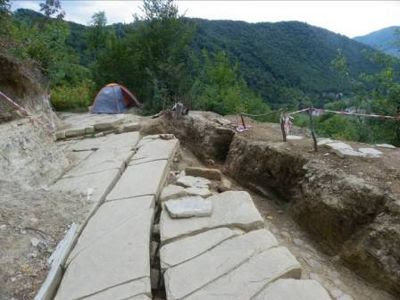 Harding has provided no evidence, and has made no reference to, or critique of, other scientists' evidence, to support his unequivocal dismissal of ancient pyramids in the Visoko valley. One must admit that the "analysis" provided by Anthony Harding, perhaps Europe's highest-ranking archaeologist, is breathtaking. In the January/February 2007 issue of British Archaeology, a publication of the educational charity called The Council for British Archaeology, Professor Harding amplified his detraction in "The great Bosnian pyramid scheme," stating that any claims of pyramids in Bosnia "belonged to a fantasy world" and adding that "a manned landing on the (non-) planet Pluto in the next 20 years is more likely" than ancient pyramids in Bosnia. Harding admits that he drew his negative conclusion about ancient pyramids in Bosnia the first time he read about Dr. Osmanagich's archaeological project. It's true: Harding admits, in print, in his own article, that he dismissed the idea of ancient pyramids in Bosnia before looking at any data, before weighing any new evidence whatsoever on the Bosnian pyramids hypothesis. This is a startling admission for a scientist to make. Shocking. "In the days following my letter [to the London Times], I was bombarded with requests for information. As a result, I decided that I would take advantage of a visit to Zadar, Croatia, in early June to drive on to Sarajevo to discuss the situation with professional colleagues there. On our way down, Predrag Novakovic (EAA secretary), Sylvie Kvetinová (administrator) and I called in at the hill of Visocica, on the edge of the town of Visoko, and looked at the excavation trenches that had been opened. We did this solely in order to avoid the charge, already laid at our door, that we had condemned the project without seeing it for ourselves. [Bolding mine.] As we expected, we saw areas of natural stone (a breccia), with fissures and cracks; but no sign of anything that looked like archaeology. The cracking in the rock was similar to many exposures we had seen in the past on natural rock formations, and did not look anything like a human construction. Geologists who have seen the site have said the same; the hill is similar in formation to many others in the Sarajevo-Zenica mining basin." Notice that Harding doesn't name these "trenches" that he tells us he has studied with his two colleagues (a secretary and an administrator – hey, that's better than nothing). How could he tell us the names of the trenches, when he never met with, or spoke with, the archaeologist who named them? And because he never told us the names of these trenches, scientists cannot be sure to which trenches he is referring. This is the opposite of science, which leaves a trail as plain as day. Harding's admission of conclusion before study is absolutely shocking. 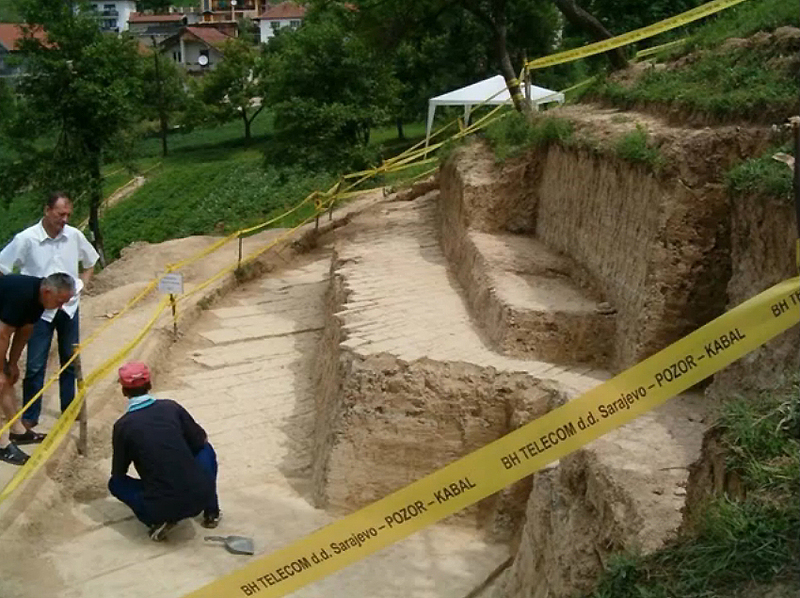 And it leads us to wonder if he was able, in fact, to "study" any archaeological evidence at all in Visoko. Can a person study something about which he has already made a conclusion? Imagine the hubris of a man who believes that his position as president of the European Association of Archaeologists obviates him from weighing evidence in making a scientific conclusion. Imagine what a man must think of himself to believe that his opinion should be taken as scientific conclusion and scientific fact. You have just imagined Anthony Harding. This is a man whom Robert Schoch, anti-science to his core, might idolize. I'm a playwright and screenwriter with an interest in ancient civilizations.